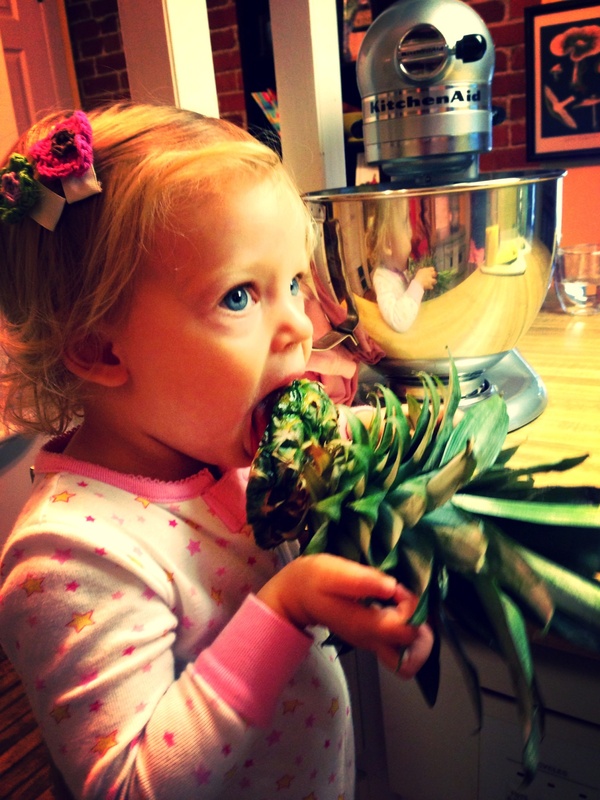 I have been fortunate enough to have a toddler who is relatively adventurous in the foods she will try — and often even like. 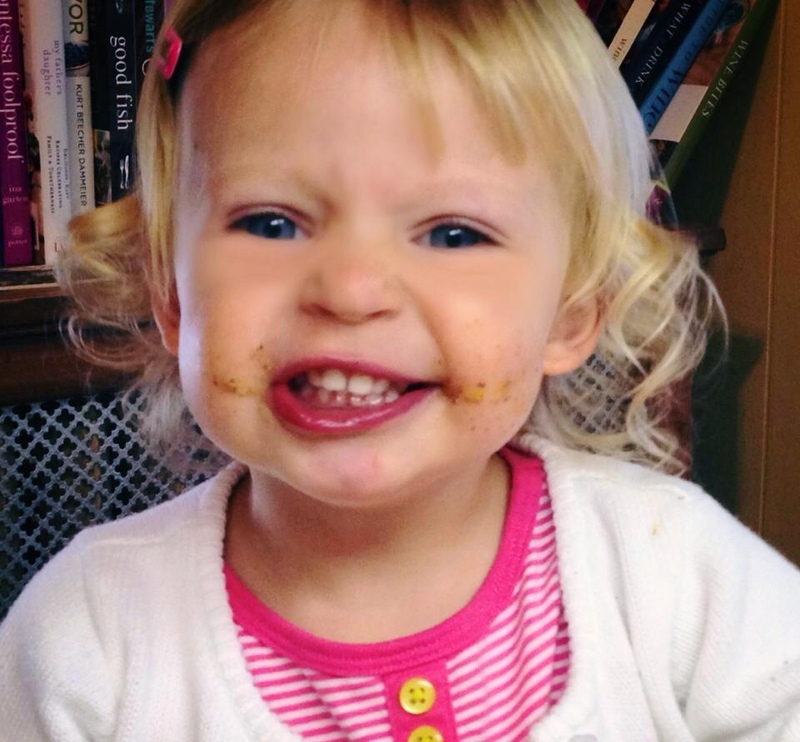 This is not to say that we don’t have our moments of refusing to eat, declaring something “yucky” simply because it’s brown, or ending a meal in tears; she is 2 years old, after all! But almost without fail, I can count on her to at least taste everything I put in front of her, even if she won’t finish it. 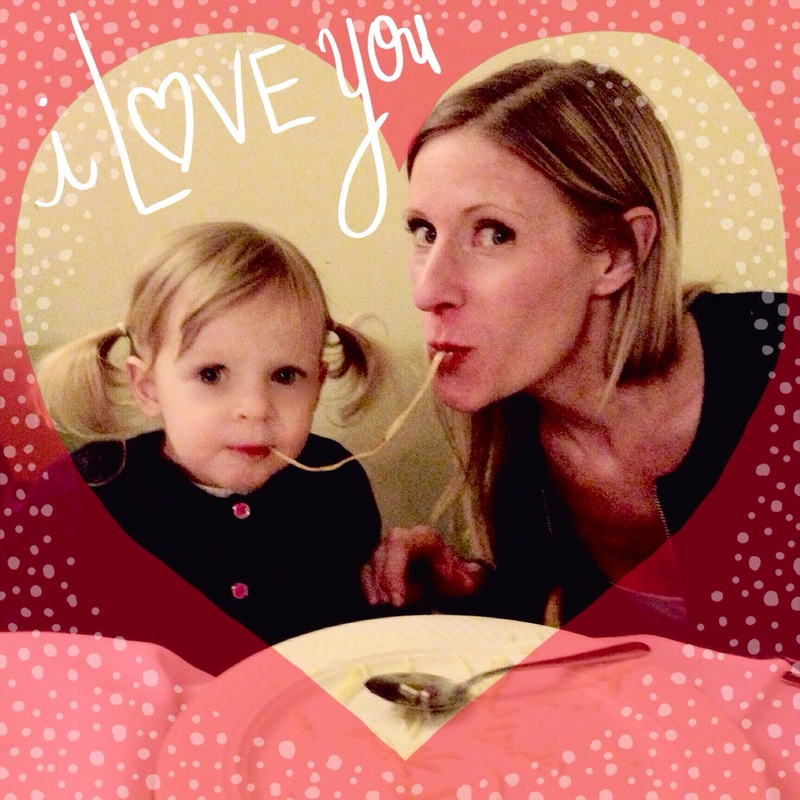 When I do find a dish that is particularly popular with her, I fell like SuperMom and do a private little victory dance in my chair across the table from her. In this weekly segment, I’ll be sharing quick, easy, healthy recipes that break away from the mac-‘n-cheese/quesadilla/chicken nugget rut that’s so easy to get stuck in. All of the meals I post here are great for kids, and delicious for adults as well. Good luck and enjoy! The beauty of this dish is that the ingredients can be adapted to fit your taste, AND it works well for breakfast, lunch, or dinner! Position a rack about 6 inches from the broiler and heat the broiler on high. Combine the onion, vinegar, and ½ tsp. salt in a small bowl; let sit for 10 minutes and then drain and pat the onion dry. Set aside. Meanwhile, on a large rimmed baking sheet, toss the cauliflower (or another vegetable) with 2 tsp. of the oil, ½ tsp. salt, and ¼ tsp. pepper. Broil, tossing once or twice, until the edges are golden, 3 to 6 minutes. Reposition rack in the center of the oven and set the oven to 400°F. 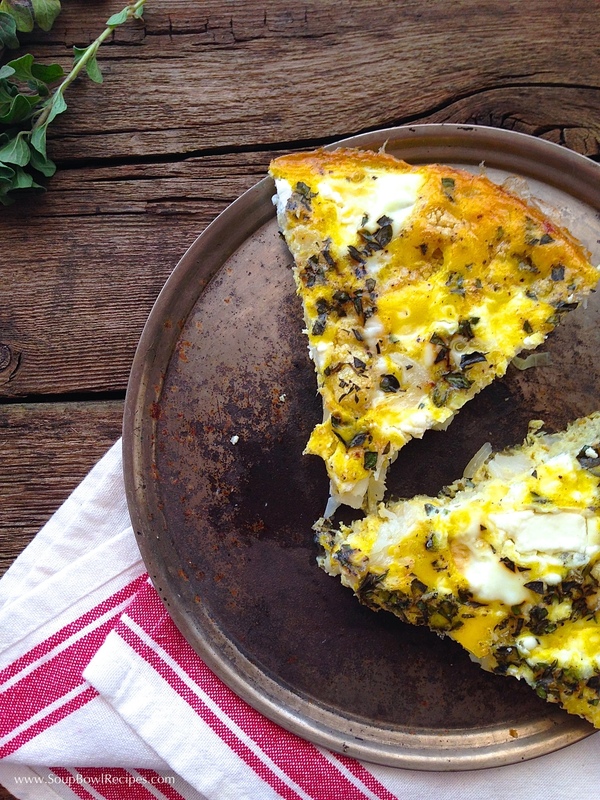 Whisk the eggs, herbs, mustard, ½ tsp. salt, and ½ tsp. pepper in a medium bowl. Heat the remaining 2 Tbsp. oil and the butter in a 12-inch ovenproof skillet over medium-high heat until the butter melts. Add the onion and cook, stirring occasionally, until some of the pieces are dark golden brown, about 3 minutes. Remove the skillet from the heat, stir in the roasted cauliflower, and then slowly pour in the egg mixture, redistributing the vegetables evenly. Sprinkle the cheese on top and bake until the eggs are set in the center, about 10-15 minutes. 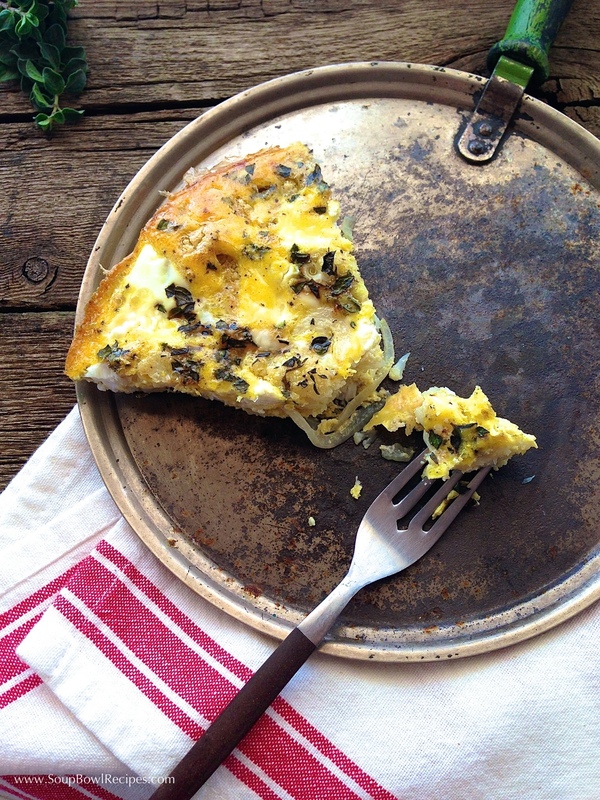 Let rest for 5 minutes and then use a silicone spatula to slide the frittata onto a serving plate or cutting board. Slice into wedges and serve. Sidekick: Serve with a crisp dry white wine like a Chablis, or an Italian dry white like a Soave or Gavi di Gavi. 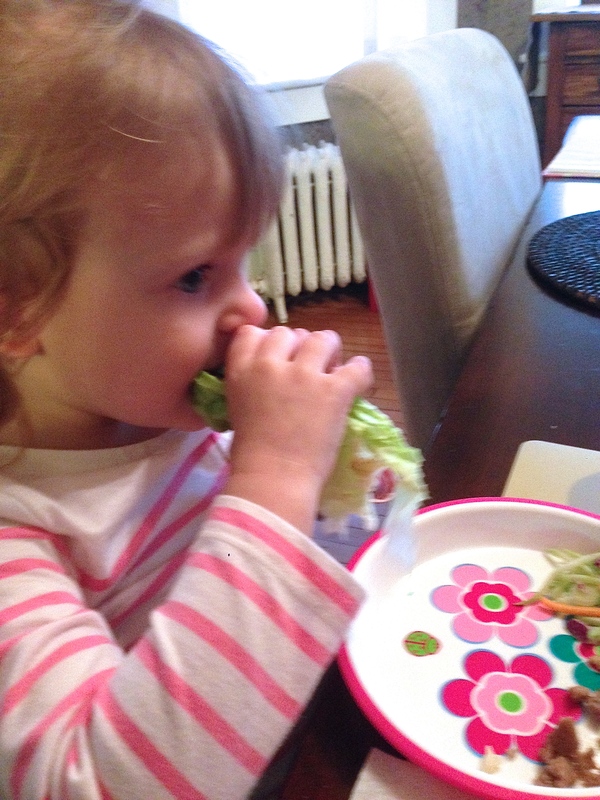 “Lettuce tacos” is what my toddler calls this fun but healthy meal. She loves it when I set up all the serving dishes in the middle of the table, let her pick her own ingredients (with assistance), roll her own wrap (also with assistance), and eat with her hands (no assistance required – except for the sweeping I get to do after she lets everything spill from the open end of her wrap). 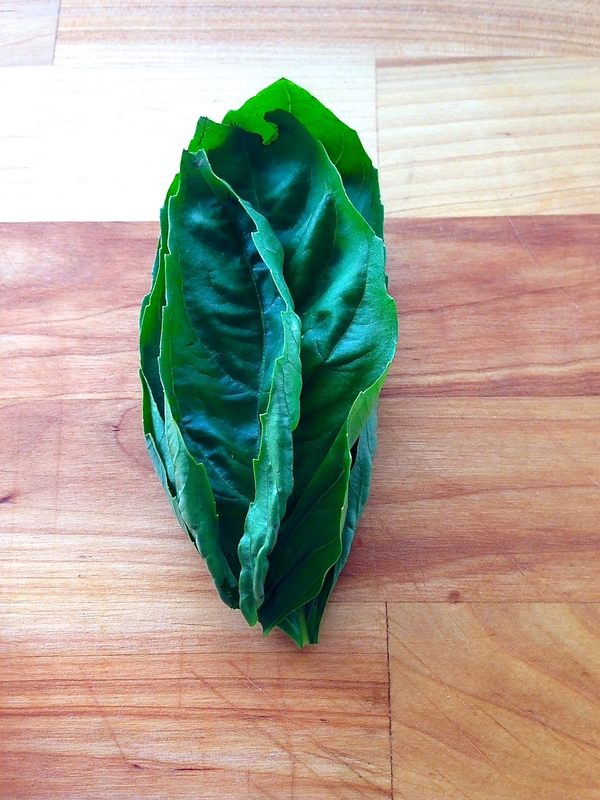 Arrange lettuce leaves on a serving platter. Set aside. Place broccoli slaw in a serving bowl, then whisk together coconut oil, juice, vinegar, and green onions until combined. Season with salt and pepper. Pour dressing over slaw and let sit for at least 10 minutes. Bring coconut water and a pinch of salt to a boil in a saucepan. Add rice and continue to boil, stirring, for 1 minute. Cover and reduce heat to low, simmer for 35-45 minutes, or until water has absorbed and rice is tender. Once rice has finished cooking, add mustard and stir to combine. Season with pepper. Transfer to a serving bowl and set aside. 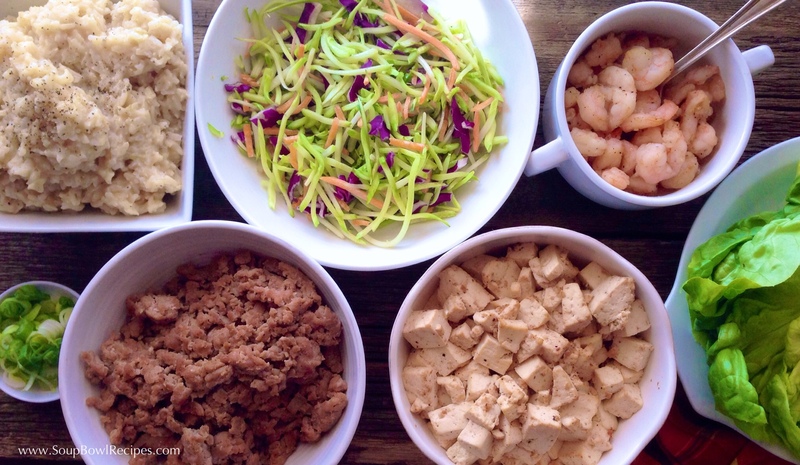 Place all serving bowls on the table and let everyone assemble their own wraps. 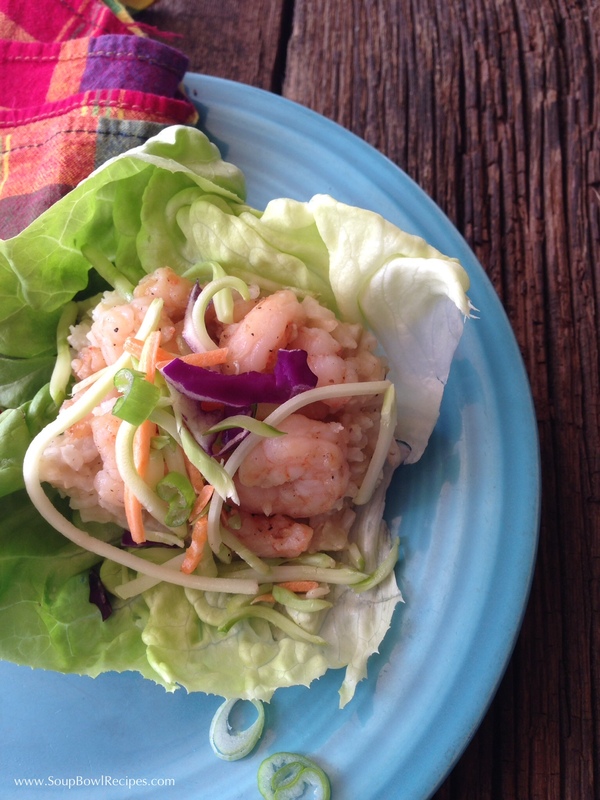 Fill lettuce leaves with a spoonful of rice, then a spoonful of protein, and top with broccoli slaw. Pick up leaves and eat like you would a taco. Sidekick: Pair with a glass of Pinot Noir, Merlot, or Rosé. Warning: Vegetarians turn back now; this post is about pigs. Lots and lots of delicious pigs! My toddler loves pigs. Absolutely loves them! I’m not talking about the cute, little pink guys that appear in most of her story books (although she loves those, too), I’m talking about the kind you eat. Bacon, ham, pork, you name it, the child will gobble it up, no questions asked. During our most recent travels, we ended up with a couple hours to kill in the Kansas City International Airport, and found a real gem of an eatery, Pork & Pickle, which serves, you guessed it…pork and pickles (among other things). 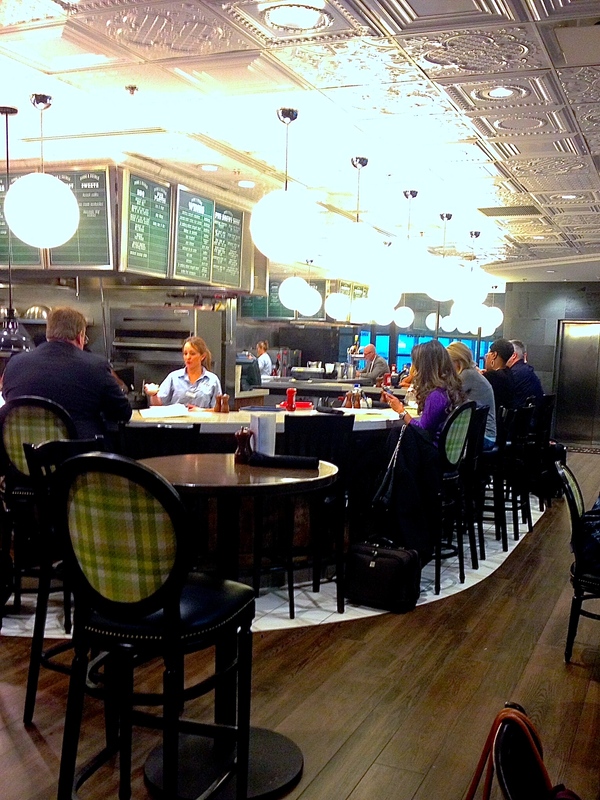 It’s located on the second floor of the Southwest terminal, and once you emerge from the wood paneled elevator, you almost forget that you’re eating in an airport. Almost. The menu had a nice variety of pork that spanned from BBQ to brats…and it got me thinking: I need to cook more pork! It’s a healthy alternative to red meat, it’s more fun than chicken, and it gets my toddler to come to the dinner table without complaint. And then, almost as if it were meant to be, the Fine Cooking magazine I brought with me to read on the plane had a great looking pork recipe. I love it when things work out like that, don’t you? Anyway, I tried it out as soon as we got home, and it turned out to be one of the best pork dishes I’ve had in a long time. And my toddler loved it, which makes it a win-win for me! Position rack in the center of the oven and heat the oven to 425°F. In a saucepan over medium heat, add chicpeas (with canning liquid) along with the bay leaves, thyme, and garlic. Heat until just starting to bubble, then reduce temperature to low and simmer for 20-40 minutes, or however long it takes you to prepare the rest of the dish. Drain, reserving ½ cup cooking liquid and garlic, discard herbs. Smash the garlic (it should be very soft, almost paste-like when smashed), chop, and set aside. Meanwhile, trim and slice each tenderloin on the diagonal into 3 thick medallions (for a total of 6 medallions). Place each medallion on a cut side, and using your hands, gently press on each to flatten slightly. Season on both sides with salt and pepper. Heat the butter and oil in a 12-inch oven proof skillet over medium-high heat until shimmering. Working in two batches, cook the pork, flipping once, until golden-brown, 2 to 3 minutes per side. Transfer to a plate and set aside. Turn the heat down to medium and add the onion and ¼ tsp. salt. Cook, stirring often, until lightly browned, 5 to 6 minutes. Add the cabbage, ¼ tsp. salt, and ½ cup water. Stir, cover, turn the heat down to medium low, and cook, stirring occasionally, until the cabbage is tender, 15 to 20 minutes. Stir in the chickpeas, reserved cooking liquid, and garlic and season to taste with salt and pepper. 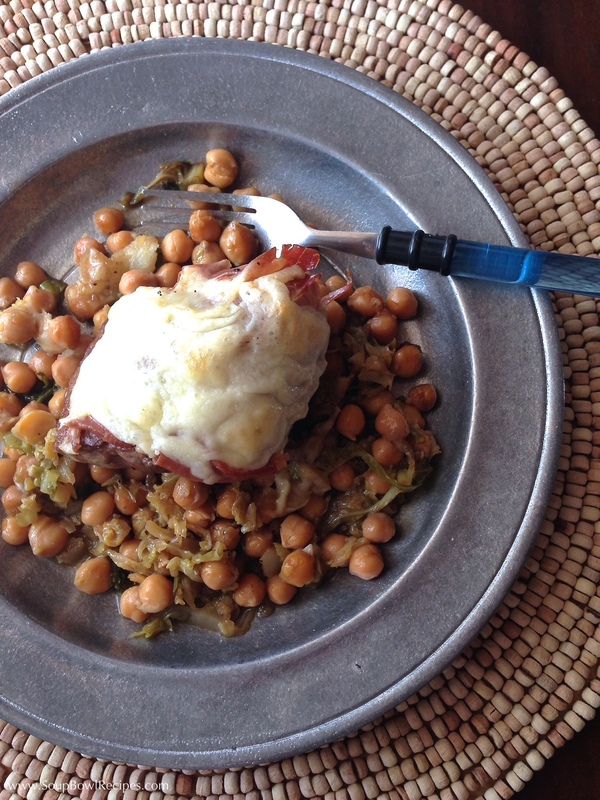 Arrange the pork (and any cooking juices that have accumulated on the plate) over the cabbage and chickpeas and top with each piece with a slice of prosciutto and a mound of grated fontina. Transfer the skillet to the oven and cook until the pork reaches 145°F on an instant-read meat thermometer, about 15-17 minutes. Let rest for 5 minutes before serving. 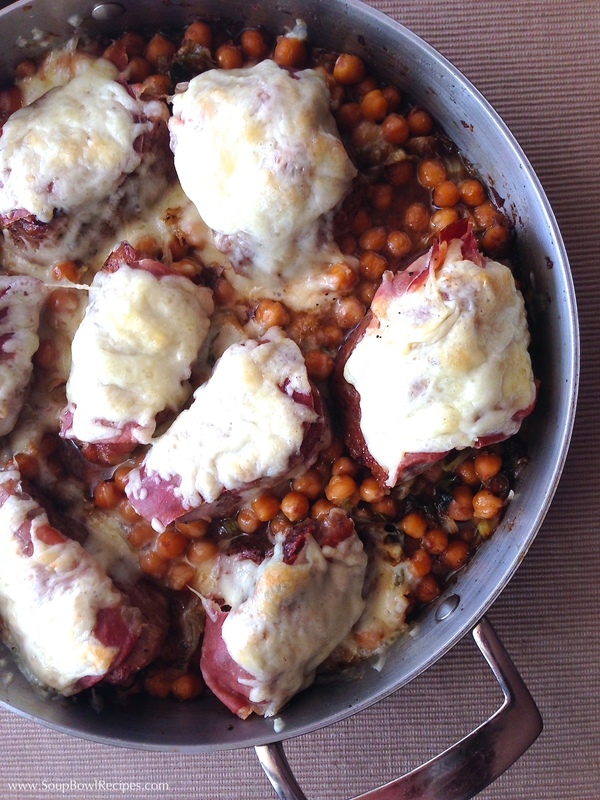 Spoon chickpeas onto plate, then top with pork tenderloin. Sidekick: Pair with a glass of Pinot Noir, Barolo, Syrah, or Chardonnay. 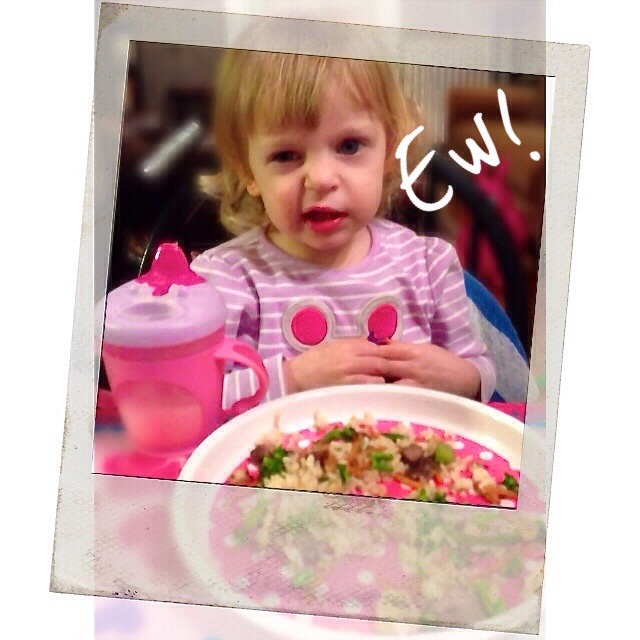 “Ew, that’s so yucky!” is my toddler’s new favorite phrase. This has been her mantra of late and she uses it in response to pretty much anything she’s offered, be it food, clothes, or a new activity. 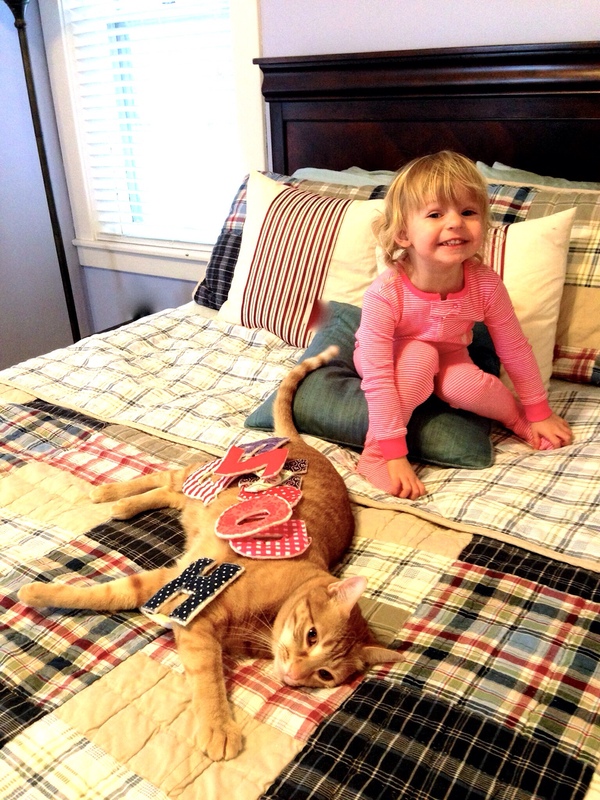 She turned 2½ a couple weeks ago and has developed an opinion about everything. EVERYTHING! 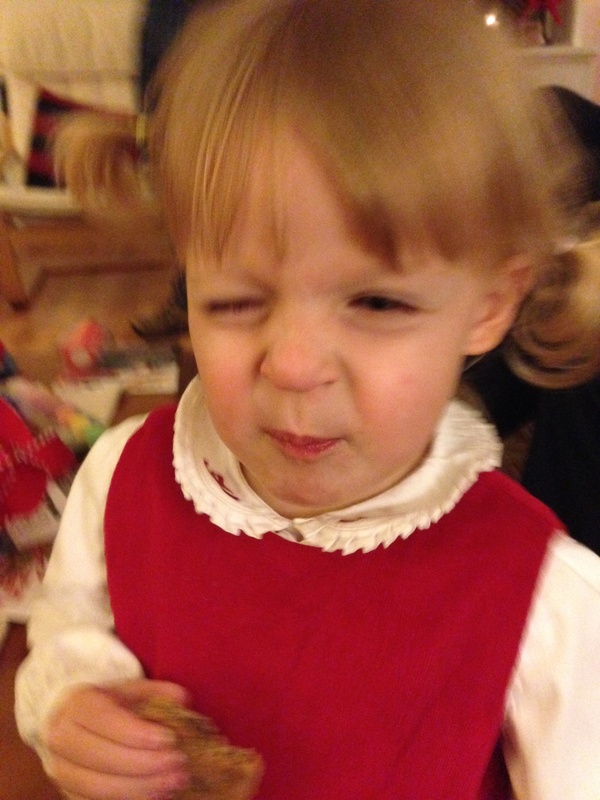 So it was no surprise to me that she turned up her nose at this dinner. “But it’s made with peanut butter,” I told her. She looked at me sideways, calculating her next move. “Peanut butter? Hmm…” She ate a bite, and then another, and another. “It’s very yucky, Mommy,” she said quietly and with much less conviction, then she slurped the last piece of meat out of her bowl and reached across the table to snag more off my husband’s plate. 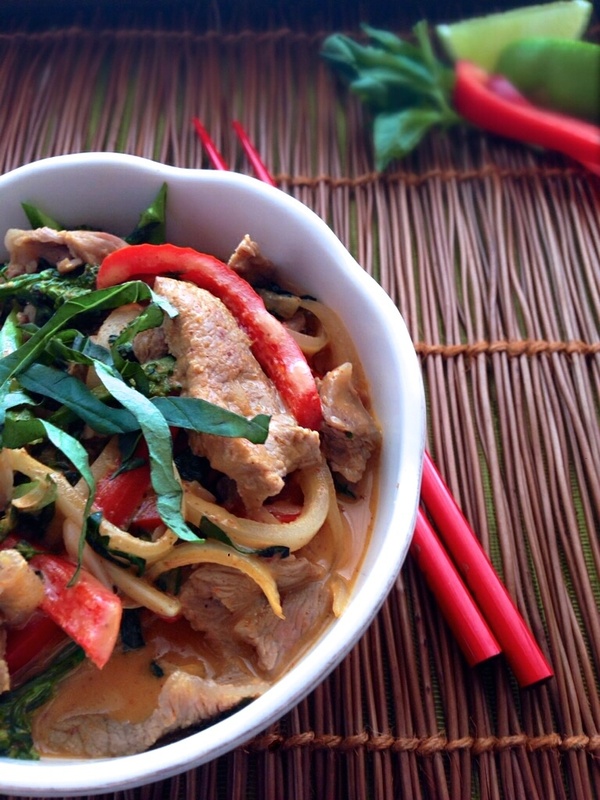 This delicious, easy-to-make Thai dish can be adapted to fit any eater and is sure to become a new family favorite! I usually prepare it with beef (pictured above) and serve it over rice noodles, but it can also be made with chicken, shrimp, or tofu and spooned over long-grain white rice or brown rice. *Note: Place the steak or chicken in the freezer for 15 minutes to make it easier to cut. With a very sharp knife, slice meat against the grain, no thicker than ⅛-inch. Cook rice/rice noodles per package instructions. While rice/rice noodles are cooking, heat a large, straight-sided skillet over medium heat. Spoon the thick coconut cream from the top of the can into the skillet. Add the curry paste and cook, stirring until fragrant and beginning to dry, about 2-3 minutes. Stir in the remaining coconut milk, almond/peanut butter, fish sauce, brown sugar, ginger, and water and bring to a simmer. Stir in the red pepper, onion, garlic, and broccolini, cover and cook until the vegetables are crisp-tender, about 3 minutes. Add the protein of your choice and half of the basil, cook uncovered, stirring often until the protein is cooked through, about 3-5 minutes. Stir in the lime juice and season with salt and pepper. Divide cooked rice/rice noodles among 4 separate plates. Spoon Panang over rice/rice noodles, dividing evenly, and sprinkle with remaining basil chiffonade. Stack 4-5 leaves on top of each other. Tightly roll the stack lengthwise (another selfie of my thumb). With a sharp knife, cut the roll perpendicularly into very thin ribbons. Repeat with remaining basil leaves. If you choose to add heat (hot chili paste) to this dish, then you’ll want a nice cold beer, either an Ale, Pilsner, Singha, or Weiss; or a glass of Riesling, either an off-dry or Spätlese. If you prefer the safer, less spicy version of this dish, add a non-oaky Chardonnay to the beverage list above. 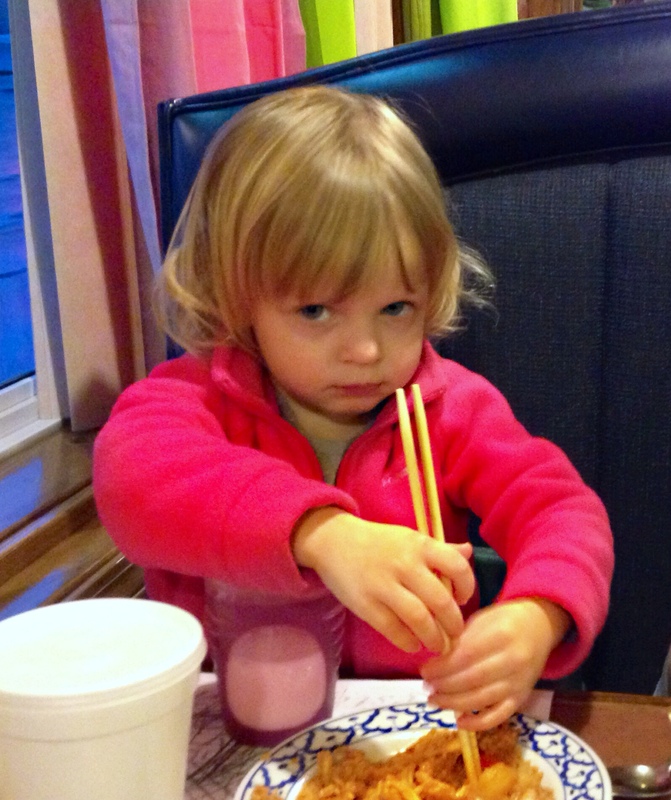 You’ve heard me mention before that word “chicken” in response to “what’s for dinner?” can insight a riot from my toddler. 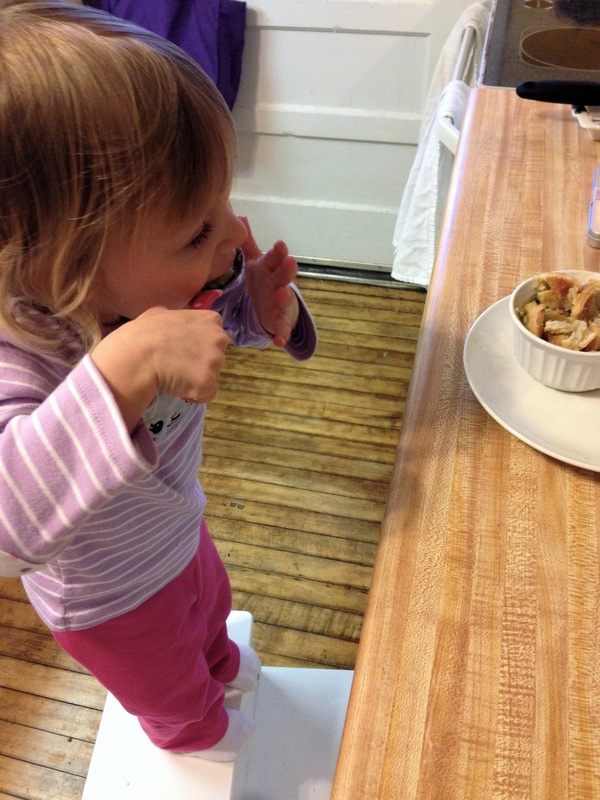 That is unless the word “chicken” is followed by the word “pie.” As you can see from the photo above, the little stinker pulled a steps tool up to the counter and started to dig in before I could get her plate to the table. Heat butter and oil in a large skillet set over medium heat, until butter has melted and begins to brown. Add shallots and thyme and cook until softened, about 3 minutes. Add thyme and garlic and cook until just fragrant, about 1 minute. Add flour and cook until thick and starting to brown. Add sherry, stirring and cooking until liquid has reduced by half, about 2-3 minutes. Add milk and stock and bring to a boil, then reduce to a simmer. To the simmering liquid, add carrots, pearl onions, and potatoes and cook until crisp-tender, about 5 minutes. Add celery, broccoli, chicken, peas, Worcestershire sauce, parsley, sugar, and salt and stir until combined. Cook for another couple minutes until all the ingredients are covered in gravy. Scoop chicken mixture into individual oven-safe baking dishes or ramekins, or one large oven-safe baking dish, filling to the top. Lightly dust a work surface with flour and roll out puff pastry dough to get rid of the seams. 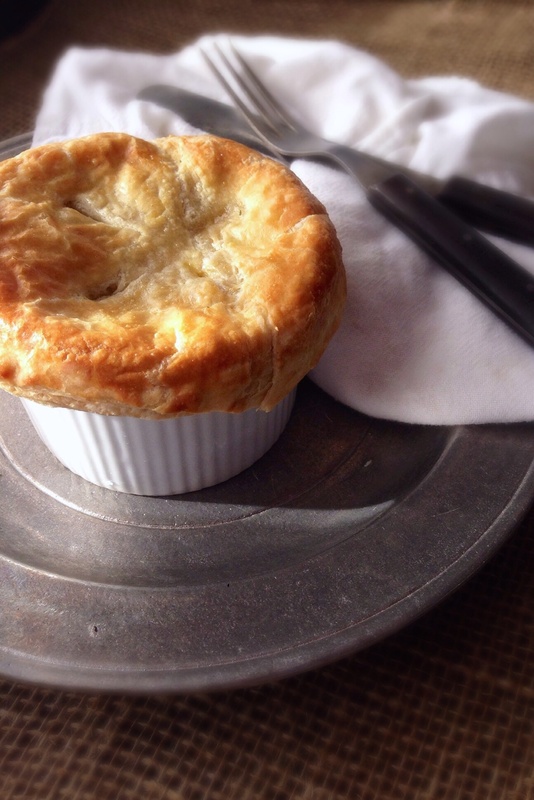 If you’re making individual pot pies, then with a sharp knife, cut rounds slightly larger than the circumference of ramekins. Place a pastry round over each filled dish, crimping the edges a bit and allowing about ½ of dough to hang over the sides. 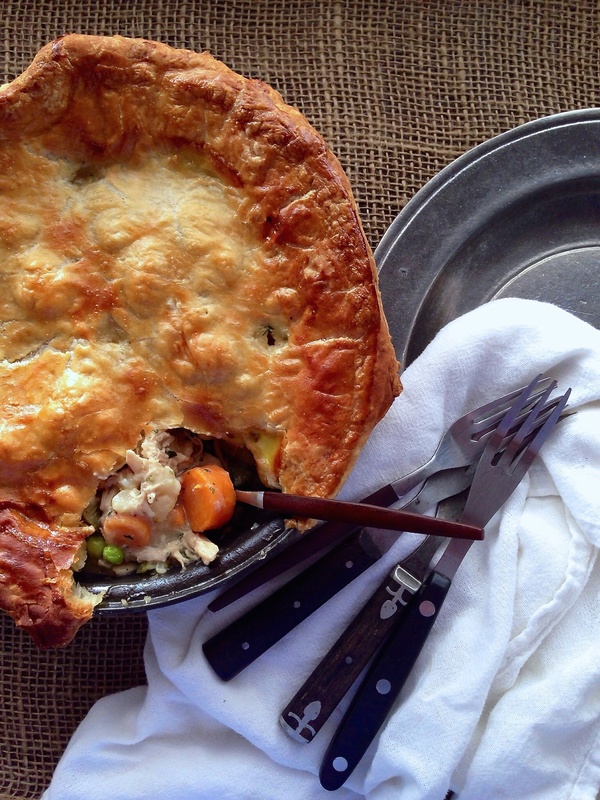 If you’re making one large pot pie, lay the sheet of dough over the baking dish, with a sharp knife, trim the dough to fit, leaving ½-inch overhang, crimp the edges slightly. Brush dough all over with egg wash and use a sharp knife to make a few small slits in the top for steam to escape. Place baking dish(es) on a baking sheet to catch the drips. Bake for 20-25 minutes or until the crust is golden brown and the inside is bubbling at the edges. Omit chicken and replace with 1 additional cup each of carrots and broccoli. 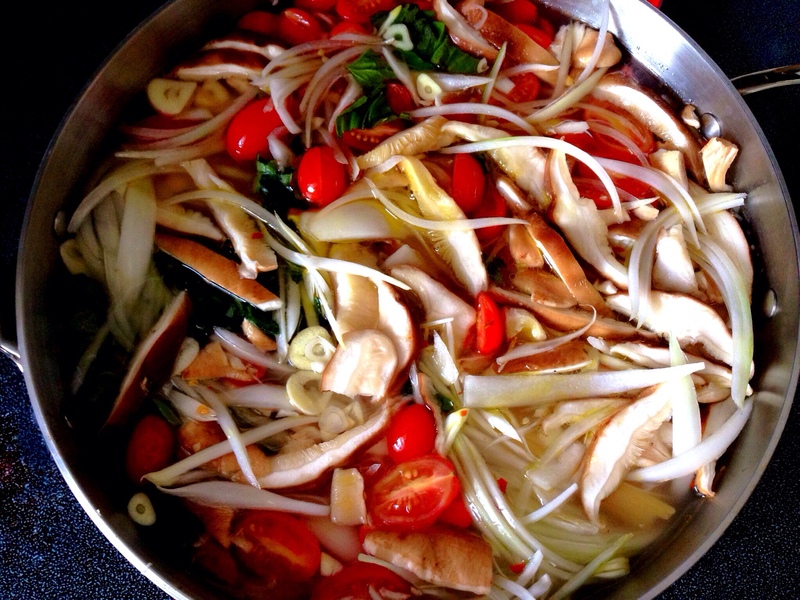 Omit chicken broth and replace with vegetable broth. 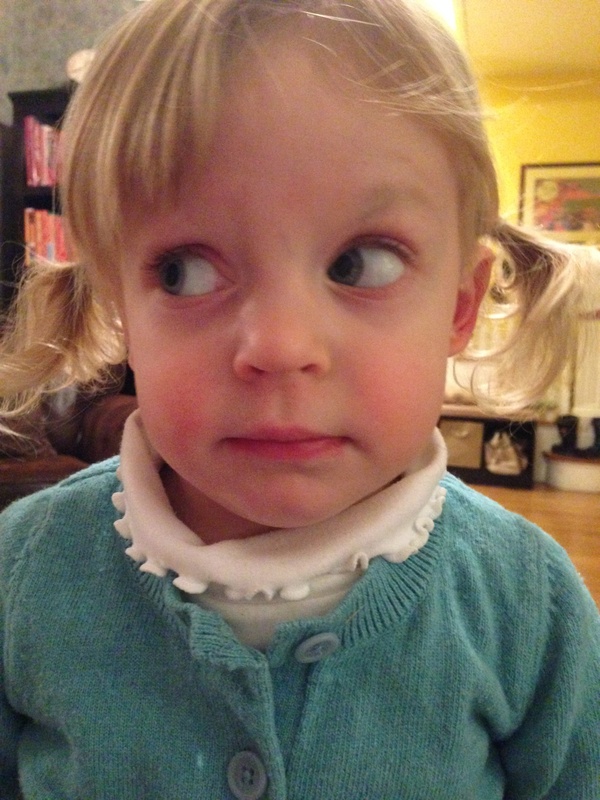 When I told my toddler that we were having chicken Parmesan for dinner she said, “No, yucky! 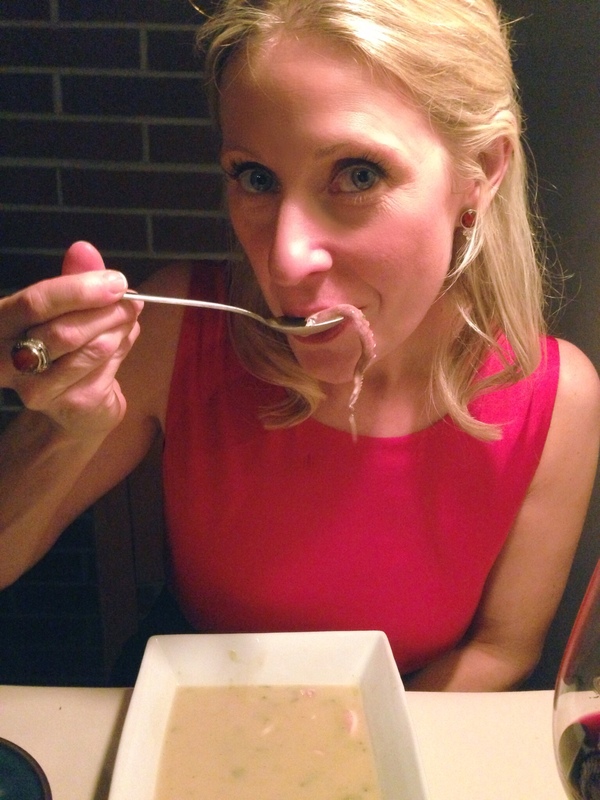 We’re having soup!” Then I put her plate in front of her and she recanted her statement: “Oh, this chicken! I LOVE this chicken!” If that’s not endorsement enough, I don’t know what is. Her favorite part of the dish is the wedge of lemon that she gets to squeeze over each bite. Each. Individual. Bite. Not over the entire cutlet, mind you, just one squeeze before every forkful. It’s an arduous, try-momm’s-patience way of eating, but she always cleans every bite off her plate. Every freshly-squeezed, 3-minutes-in-the-making, pull-your-hair-out-waiting bite. Oy! Pat chicken dry with a paper towel, then season with salt and pepper. Working with one cutlet at a time, dredge in flour, shaking off any excess. Transfer to bowl with beaten egg and turn to coat. Lift from bowl, allowing excess to drip back into bowl. Coat with panko mixture, pressing to adhere. DO AHEAD: Chicken can be breaded 3 months in advance. Place between pieces of waxed paper and freeze in resealable freezer bags. Thaw before continuing. Heat 6 Tbsp. oil in a large heavy skillet or a cast-iron skillet over medium heat. Working in 2 batches, cook cutlets, adding remaining 2 Tbsp. oil to pan between batches, until golden brown and cooked through, about 4 minutes per side. 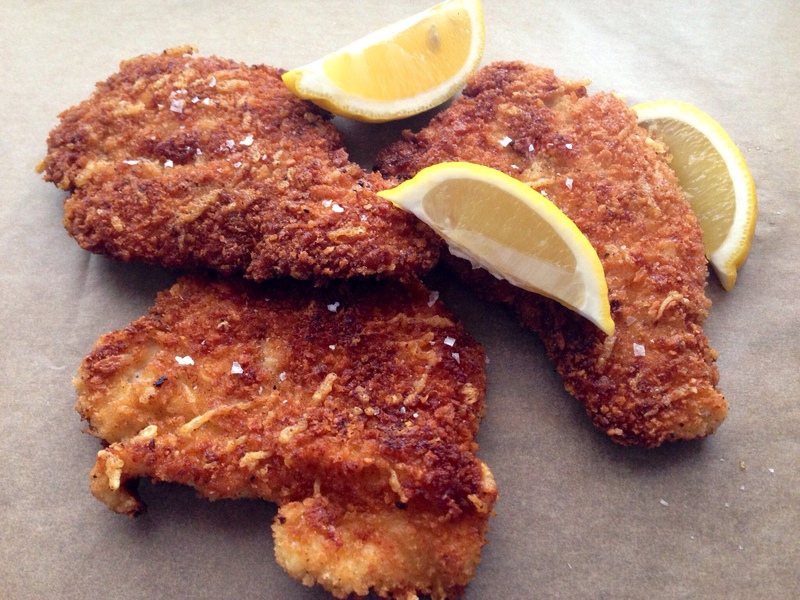 Transfer cutlets to a paper towel-lined plate and season with salt. Serve with lemon to squeeze over top. Serve with a chilled glass of Sauvignon Blanc or a non-oaky Chardonnay. A simple starch and vegetable medley is all you need to make this a hearty meal (see Winter Squash and Brussels Sprout Bake recipe below). Preheat oven to 350°F. Combine all ingredients except Parmesan in a baking dish. 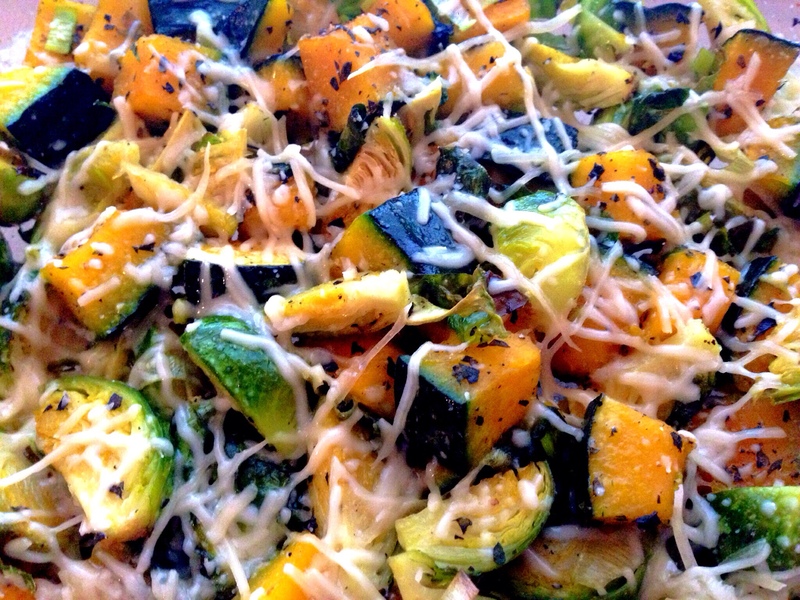 Bake for 30 minutes, or until the Brussels sprouts have browned and the squash is fork tender, tossing halfway through. Sprinkle Parmesan over veggies and return baking dish to the oven for 3-5 minutes, until cheese has melted and has started to bubble. This is a very loose (and healthy) adaptation of Chinese sweet & sour chicken. My family has been making it for years, and I’m not sure where the recipe came from anymore. I have a second generation photocopy that has some ingredients scribbled out and others written in, there are soy sauce drips across the top, and an entire corner is torn away. I’d love to credit the original author, but without forensic assistance, I don’t believe that would be possible. Preheat oven to 425°F. Lightly mist a baking dish with cooking oil. In a medium saucepan, bring water to a boil. Add rice and stir for one minute. Reduce temperature to low and simmer, covered for 20 minutes, or until rice is cooked. With a meat mallet, pound chicken breasts to a ½-inch thickness and prick all over with a fork. Season with salt and pepper, and place in baking dish. In a small bowl, whisk together soy sauce, molasses, and sesame oil until combined. Pour molasses sauce into baking dish with chicken, turning chicken so that it’s fully covered. Bake for 15 minutes, turning chicken half way through. Remove baking dish from oven and carefully pour molasses sauce into a small bowl. Return chicken to oven and increase temperature to broil. Broil for 2-3 minutes or until chicken becomes brown and crispy at the edges. Remove baking dish from oven and let rest 10 minutes before slicing. Meanwhile, whisk together oil, vinegar, molasses, garlic, ginger, and jalapeños (or chiles) until combined. Once rice has finished cooking, pour vinaigrette into the rice pot and stir until combined. Season with salt and pepper. Divide rice among 4 plates. 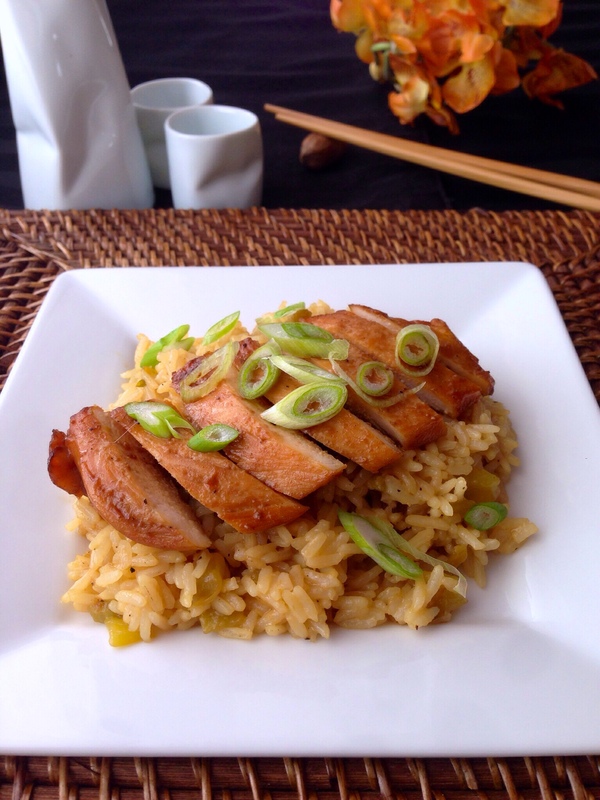 Lay 1 breast of sliced chicken on top of rice, and spoon 1-2 Tbsp. molasses sauce over chicken. 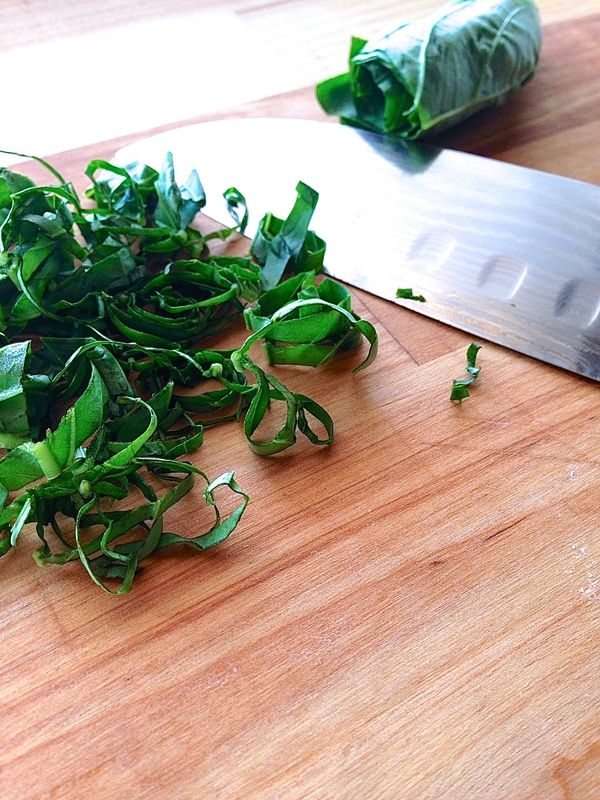 Garnish with sliced green onions. A plate of steamed broccoli would serve as a quick, easy side dish, and an excellent sponge for the delicious molasses sauce you don’t want to go to waste. Serve with sake; either Junami (rich, medium-bodied), or a sweeter variety. “Risotto! Risotto! 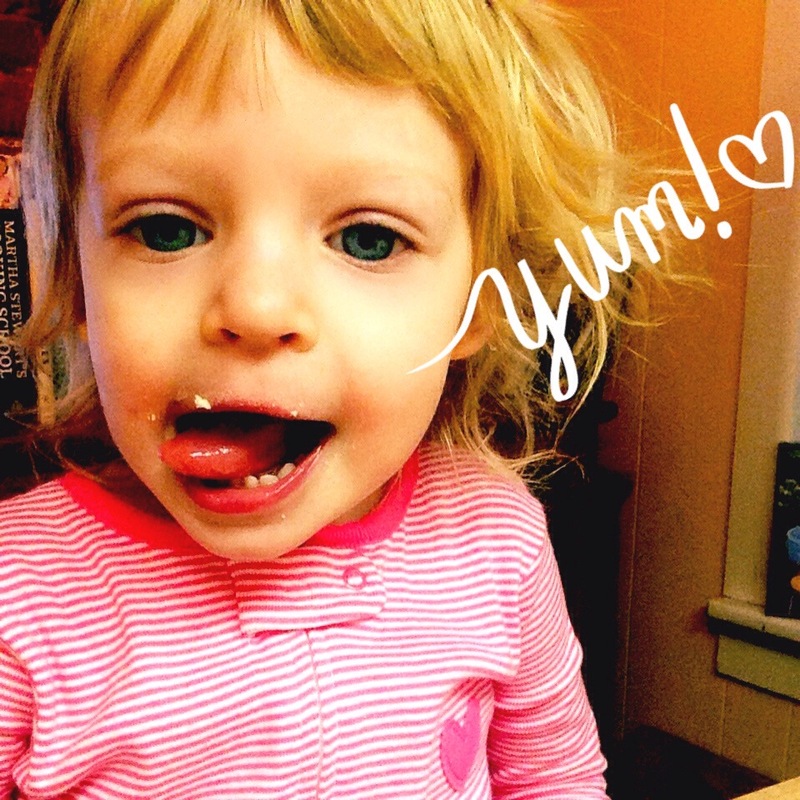 Risotto!” my toddler squeals with delight as she jumps about the kitchen clapping her hands. This is not a typical response to many of the dishes I serve for dinner. 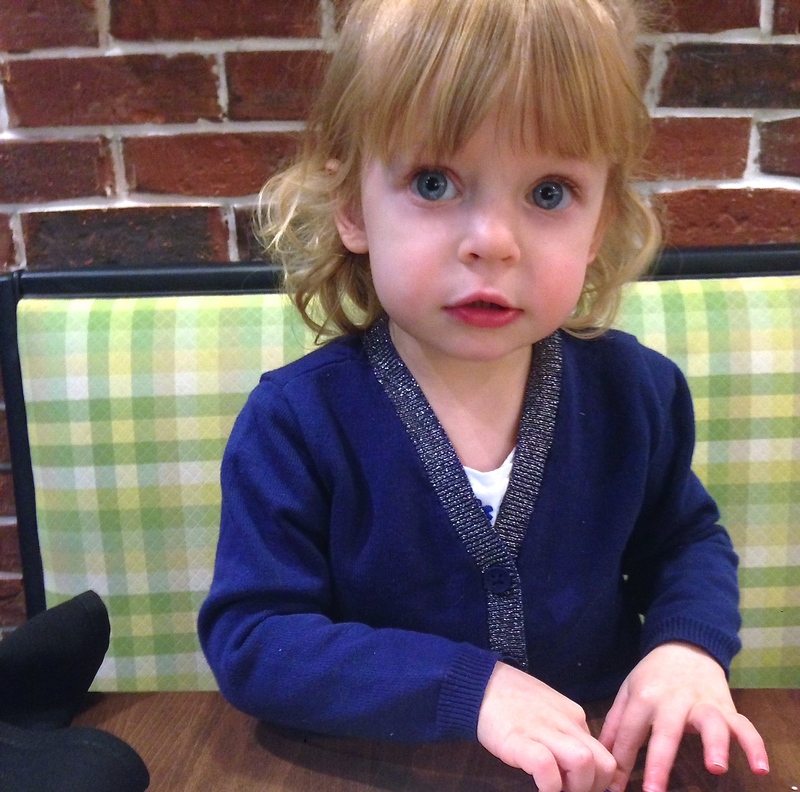 Dinner, in fact, is her least favorite meal, as it usually doesn’t arrive in the form of a sandwich or a waffle. 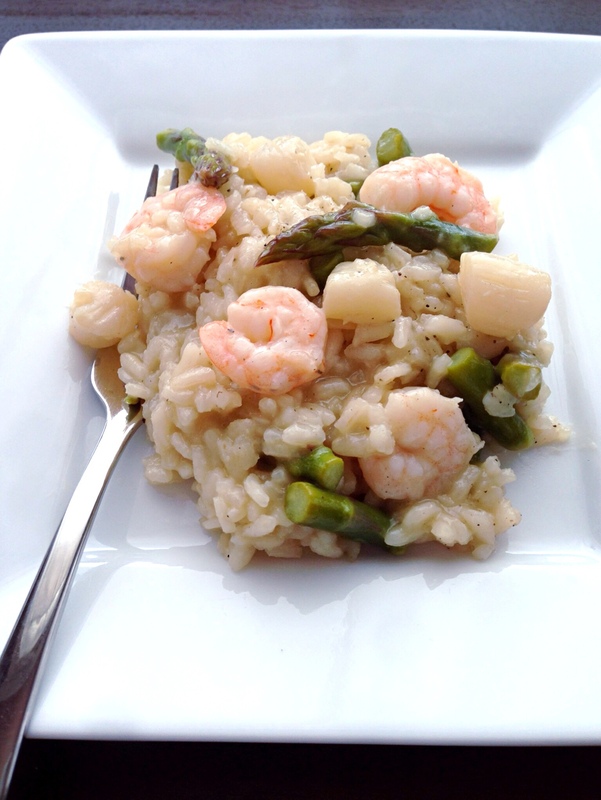 But risotto is different; especially seafood risotto. She thinks she’s getting away with something when I serve it, “You mean I get to eat a whole plate of rice and nobody’s gonna stop me? Yes, please!” The only static this meal causes is when she runs out of shrimp and gets bent that my husband and I won’t fork over ours. Not a bad argument to have with a toddler, as far as I’m concerned! Risotto is a traditional Italian meal made with a short-grain rice called Arborio. The higher starch content in the rice adds creaminess to the dish, without actually adding cream to the dish — so it’s a win-win for those calorie counters! This recipe takes a bit more hands-on attention, as it needs to be stirred continually for about 30 minutes, but it’s worth every bit of elbow grease — consider it part of your daily workout! *Note: All of the alcohol in the wine burns off as it cooks, so it’s safe to serve to children, however, if you prefer, replace wine with an extra cup of stock. In a saucepan, bring stock and wine to a low simmer. Meanwhile, over medium-low heat, melt butter and oil in a large straight-sided skillet until bubbly. Add shallots and cook until tender, about 3-4 minutes. Add risotto and garlic and cook for 1 minute. Using a large soup ladle, pour 1 ladle-full (about ½ cup) of stock into risotto and stir until liquid is absorbed. Gradually stir in remaining broth 1 ladle-full at a time, cooking and stirring until liquid is absorbed before adding the next ladle. Continue this process until all but 1 ladle-full of stock has been used, approximately 25-30 minutes. Add the last ladle of stock with seafood and asparagus, and reduce heat to low. 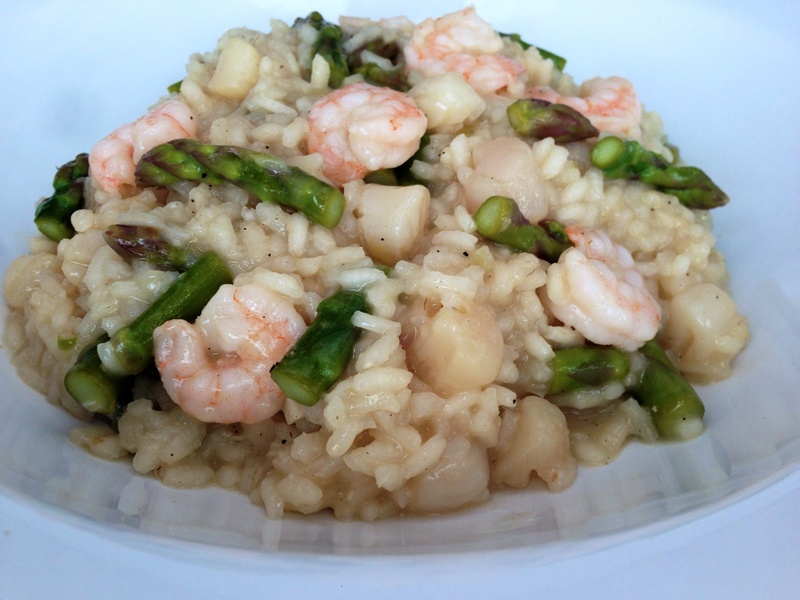 Cover and cook for 5 minutes or until shrimp and scallops are fully cooked and asparagus turns bright green. Uncover and stir until all remaining liquid has evaporated, about 2-3 minutes. Season with salt and pepper. 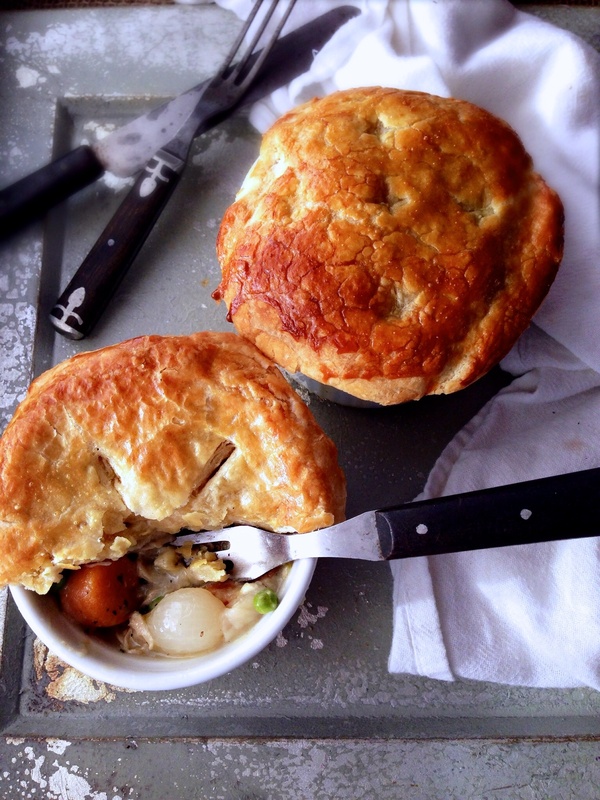 Sidekick: Serve with a chilled glass of Sauvignon Blanc or a non-oaky Chardonnay. Use precooked seafood and toss it in at the end of the cooking process after the asparagus have been steamed. Stir until seafood is heated through. I have to admit, as much as I trust Martha Stewart and her very accomplished staff (not that I’m biased or anything), I was a bit skeptical when this recipe called for throwing all the ingredients into a pan and cooking them together, rather than separately. Pasta in one pot, sauce in the other, that’s how I was raised — but WOW! this is so much better. And at the end of the meal, you only have one pan to clean. Brilliant! 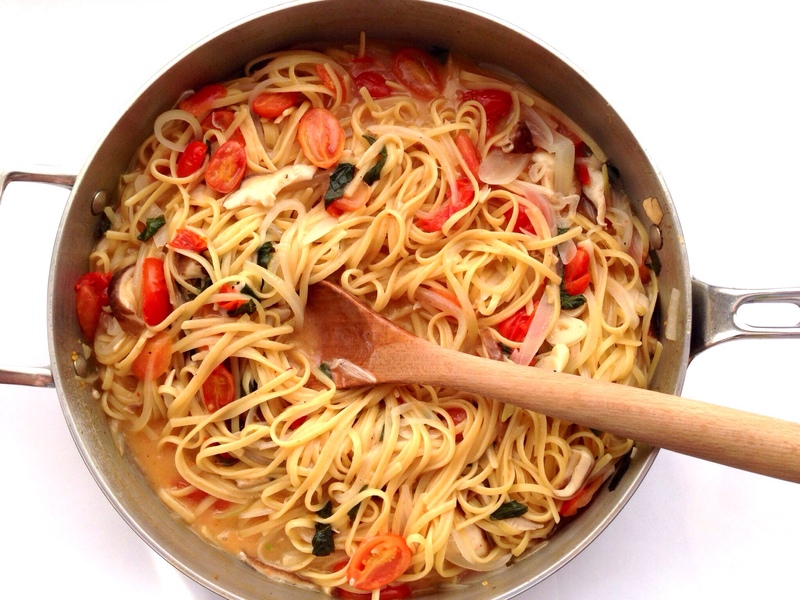 Combine pasta, tomatoes, onion, garlic, red-pepper flakes, basil, oil, 2 tsp. salt, ¼ tsp. pepper, and water in a large straight-sided skillet. Bring to a boil over high heat. Boil mixture, stirring and turning pasta frequently with tongs, until pasta is al dente and water has nearly evaporated, about 9 minutes. 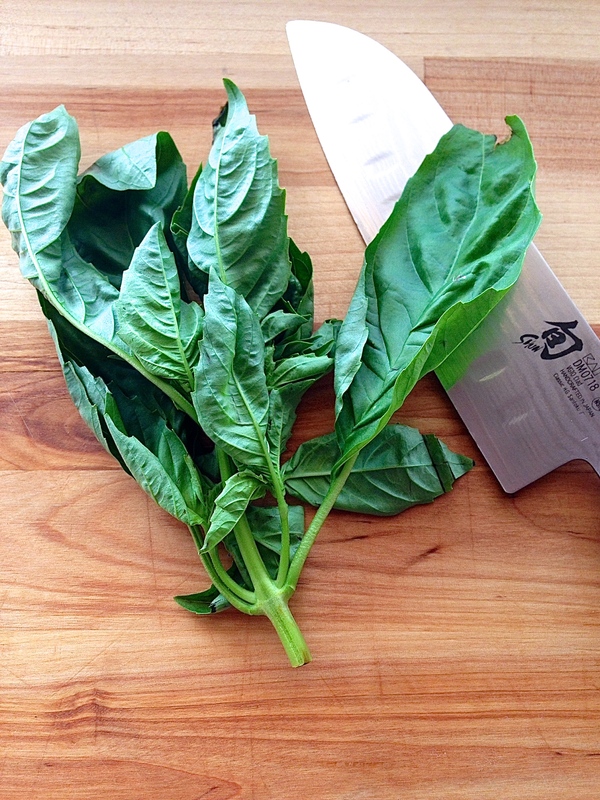 Season to taste with salt and pepper, divide among 4 bowls, and garnish with basil. Serve with oil and Parmesan. 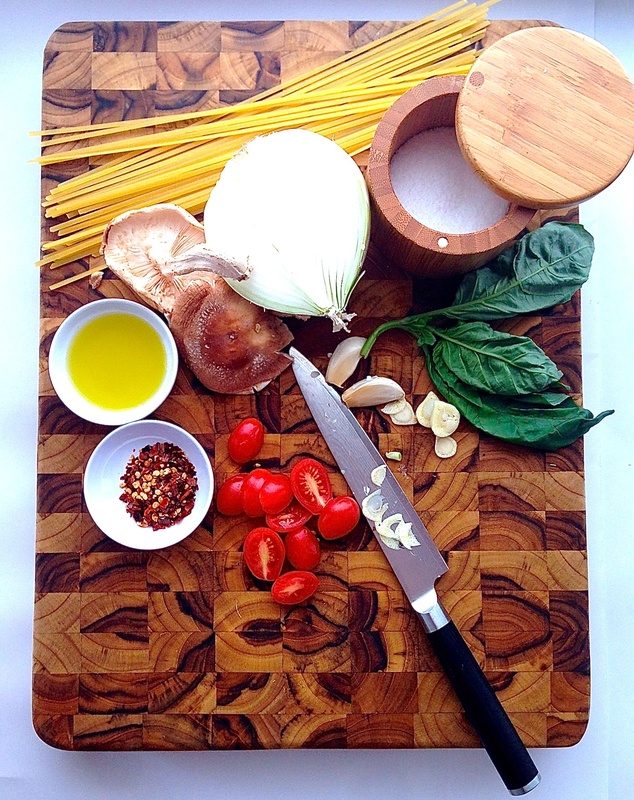 Sidekick: The simplicity of this pasta pairs well with a Pinot Gris or a Sauvignon Blanc. Beat egg yolks with water until smooth. After pasta has finished cooking, remove from heat, add egg mixture, butter, and bacon and stir until creamy. Season with salt and pepper and serve with grated Parmesan. Add asparagus at the beginning with dry pasta. Meanwhile, juice and zest lemon. Once pasta has cooked for about 7 minutes, add lemon juice and peas. Stir and continue to cook for 2 minutes or until pasta is al dente. Season with salt and pepper. Divide into 4 bowls and garnish with parsley and lemon zest. Add bell peppers at the beginning with dry pasta. Once pasta has finished cooking, add diced chicken and oregano. Stir to combine. Season with salt and pepper and serve with Parmesan. 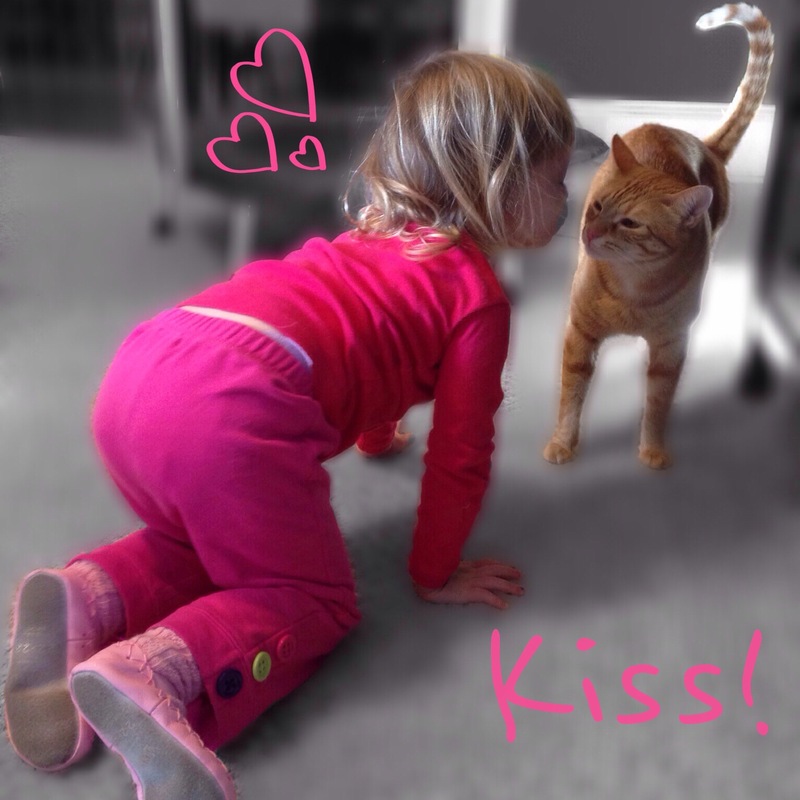 * Photo: The Toddler Terrorizing The Cat. Heat oil in a large cast-iron or other heavy skillet over medium-high heat. Add apples, cut side down, and cook, turning occasionally until golden brown, 5-8 minutes. 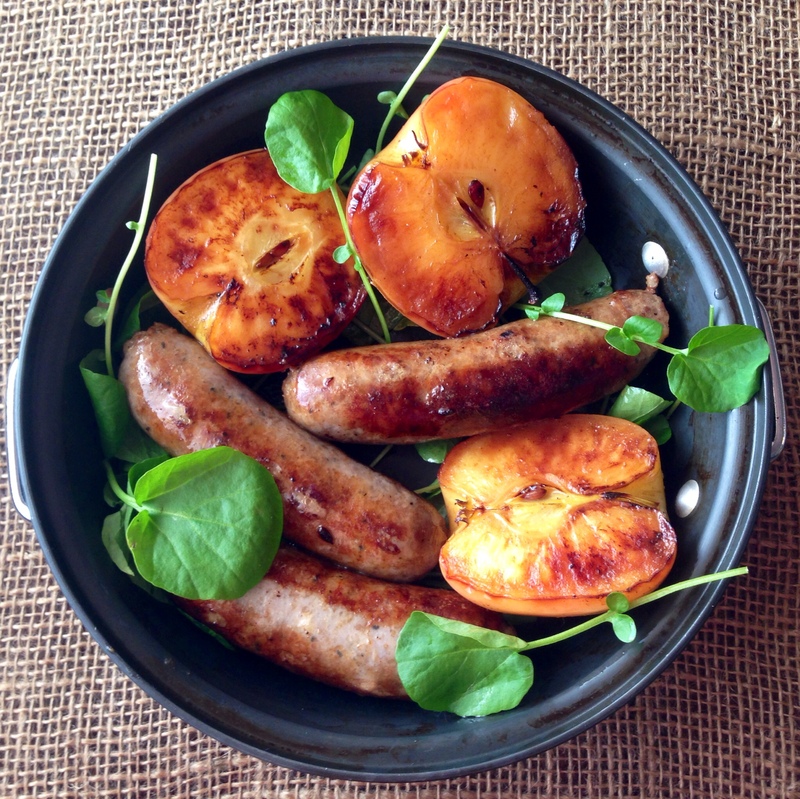 Prick sausages with a fork, add to skillet with apples, and cook, turning occasionally, until browned. 10-12 minutes. Add wine and vinegar to skillet. Bring to a boil, reduce heat, and simmer until thickened (liquid should coat a spoon), about 4 minutes. Add watercress and toss to coat, season with salt and pepper. Serve with pan juices spooned over. A fruity Zinfandel and an off-dry German Riesling pair well with the sweet apples. Crispy oven potatoes are an excellent starch to help soak up the delicious pan juices you don’t want to go to waste (recipe below). I make these potatoes a few times a month and always change up the seasonings to match the flavor of the meal. For this dish, I like smoked paprika and dried oregano, which off-set the sweetness of the Italian sausage and lady apples, but you can use thyme and fennel, rosemary and parsley — or whatever else suits your fancy. Preheat oven to 375°F. Lightly mist a baking sheet with cooking spray. 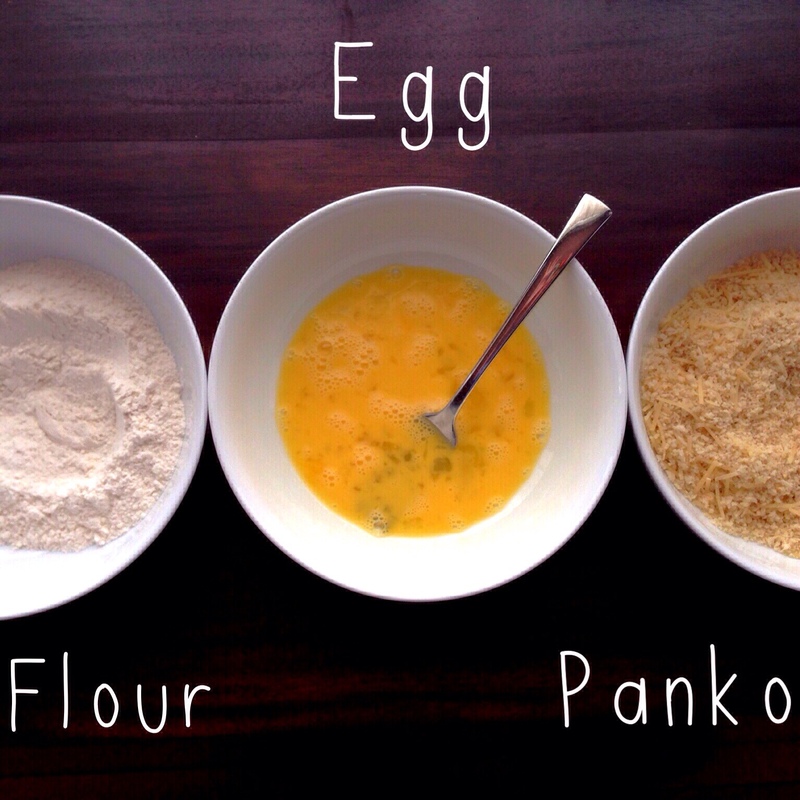 In a bowl, mix all ingredients until combined. Spread seasoned potatoes evenly on sheet and bake for 20-25 minutes, tossing half way through. I hail from the great Pacific Northwest and cut my teeth on a variety of seafoods, ranging from the typical salmon and shrimp to the not-so-typical geoduck and octopus. When my toddler was old enough to start on solids, it was important to me that she appreciate seafood as much as I do, so I made sure to introduce her to fish right away. One of the first things I tried was coconut shrimp. I ordered it in a restaurant and gave her one to taste. She held it upright by the tail, eating it like some do a corn dog: slowly nibbling away at the crunchy coating, then devouring the inside in a matter of seconds. She reached for another, and another, until she had stuffed herself and finished nearly half of my meal. Now, when I make this recipe at home, she’ll cozy up to the counter, wag her finger at the platter of shrimp and whisper, “I will eat you, little shrimpies!” So…if you’re a family of seafood-lovers like us, these healthy baked coconut shrimp will be a hit! And if you’re not, it’s an excellent way to warm up your tastebuds to our delicious friends under the sea. Regardless of where you plan on watching the Big Game, at home or with friends, football fans work up an appetite, so be prepared with some easy finger-food. Impress your fellow tailgaters with a basket of coconut shrimp and a trio of dipping sauces — I promise they won’t even realize it’s healthy! 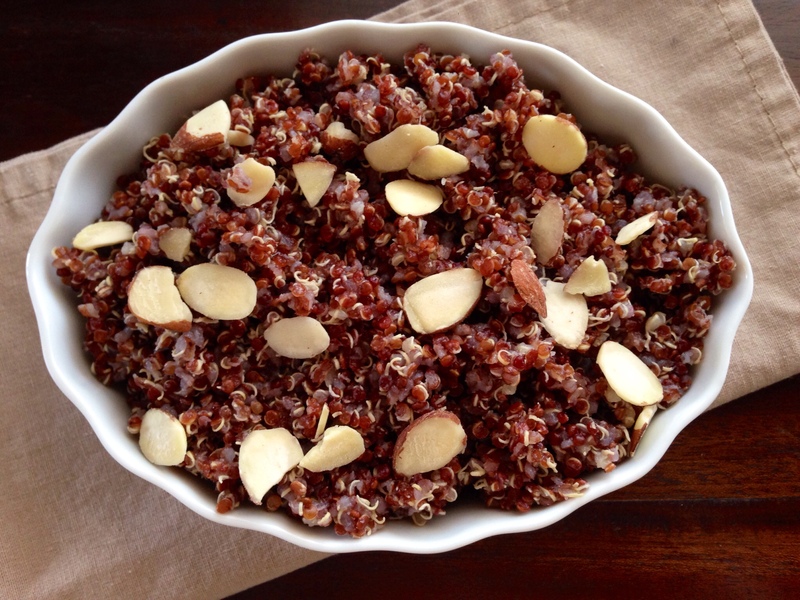 (Recipe slightly adapted from Clean Eating) #GoHawks! Preheat oven to 375°F. Line 2 large, rimmed baking sheets with foil and mist with cooking spray. Place 3 wide, shallow bowls on a work surface. To first bowl, add flour; to second bowl, add eggs and beat lightly; to third bowl, add panko, coconut, salt and pepper and stir to combine. Pat shrimp dry with paper towels. Holding 1 shrimp by the tail, dip in flour, shaking off excess. Quickly dip in egg, then in coconut mixture, coating thoroughly. Place on baking sheet and repeat with remaining shrimp. Bake for 12-14 minutes, rotating pans halfway through and flipping shrimp, until they are firm to the touch, lightly brown on the outside with bright pink tails. Meanwhile, in a small saucepan on low heat, combine jam, lime juice, fish sauce, and cayenne pepper and cook, stirring constantly, until sauce is fluid and warmed through (*note: do not bring to a simmer). 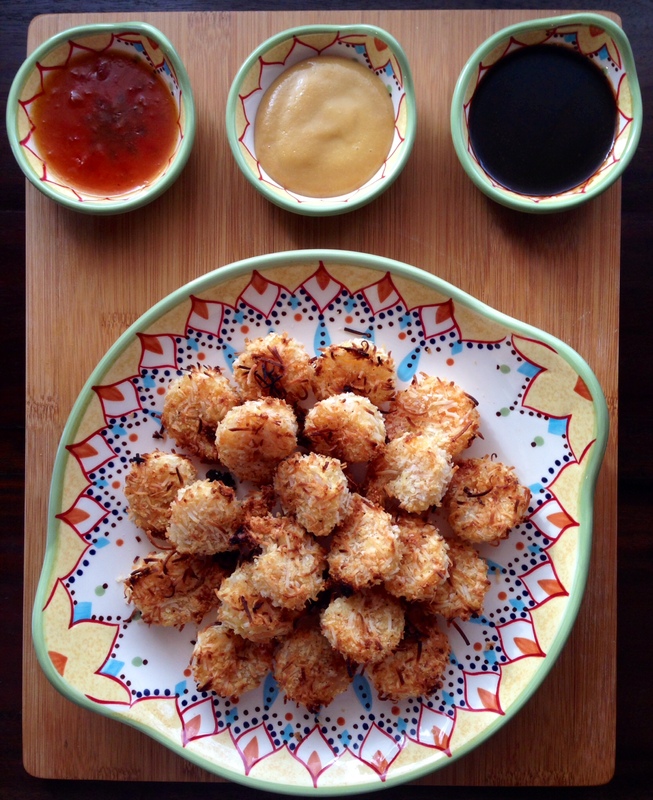 Serve shrimp with apricot-lime dipping sauce, teriyaki sauce, and honey mustard. 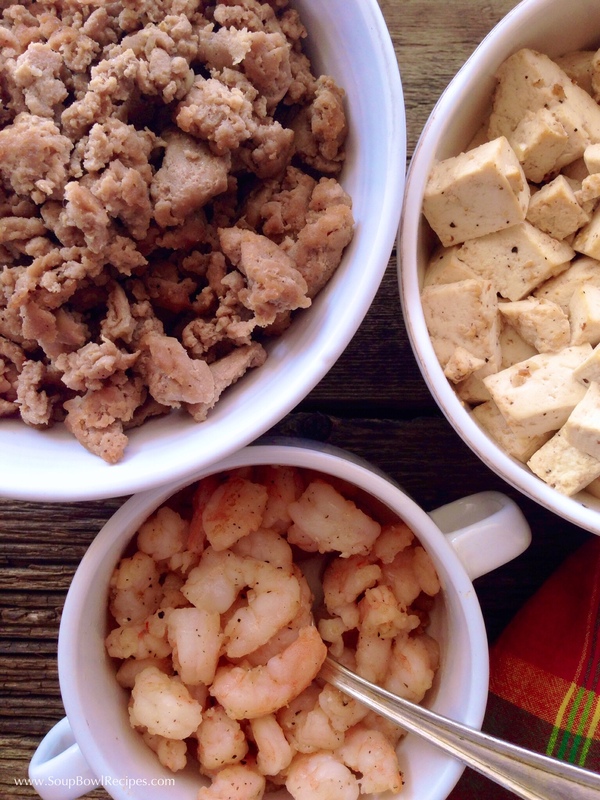 Serve with a glass of buttery Chardonnay (avoid oaked), an off-dry Riesling, or a nice cold Pilsner. To upgrade these shrimp from an appetizer to full-fledged meal, serve alongside jasmine rice topped with stir-fried vegetables (recipes below). This recipe can be adapted to use any vegetables of your choice; just remember to add the longer-cooking veggies to the pan first, followed by the softer, quick-cooking vegetables. In a wok or large skillet with tall sides, heat oil over medium-high heat until shimmering. Carefully swirl oil around in pan to coat sides. Add ginger and garlic and cook until fragrant, about 1 minute. Transfer to a plate. Add broccoli and bell peppers and sear, undisturbed, for 2 minutes, then toss and continue to cook for an additional minute. 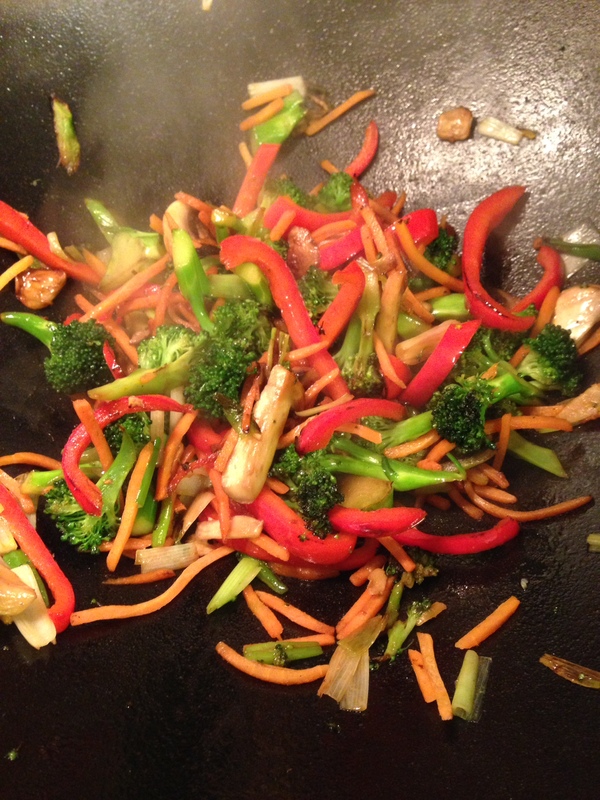 Push the broccoli and peppers up the sides of the wok or to the outer edge of the skillet, creating a open space in the center. Add carrots and mushroom to the center of the pan, and cook, undisturbed, for 1 minute. Toss and cook for an additional minute. Add green onions, reserved ginger and garlic, 2 Tbsp. soy sauce, and 1 Tbsp. vinegar to pan. Toss all vegetables together, cooking until softened, about 1-2 minutes. Taste and add more soy sauce and/or vinegar if needed. Season with salt and pepper and serve over cooked rice. Using coconut water in place of tap water gives the rice a slight sweetness and provides a nice base for the savory vegetable stir-fry. In a sauce pan, bring coconut water and salt to a boil. Add rice, and stir for 1 minute. Reduce heat to a simmer, cover, and cook for 18-20 minutes or until rice is soft. Remove from heat and fluff with a fork. Serve hot. Food is huge part of daily life in our household. We eat it. We discuss it. We take pictures of it. We blog about it. 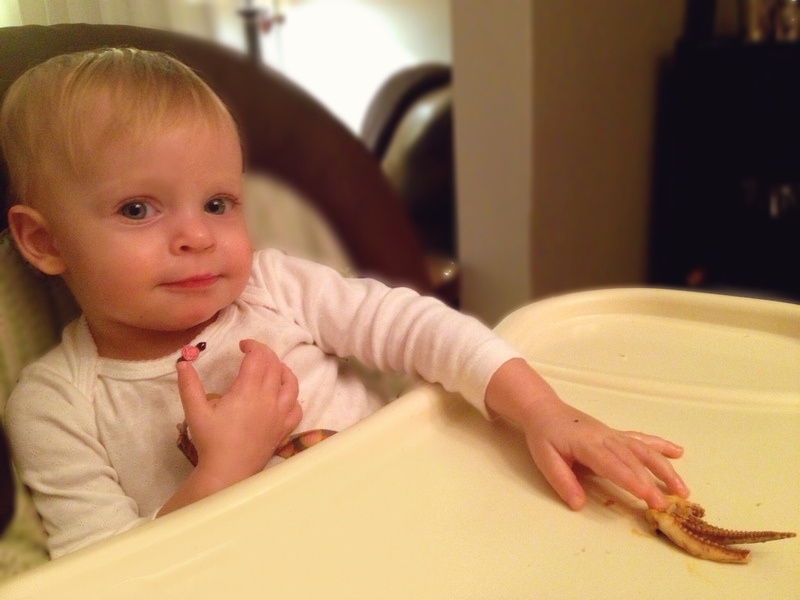 So, it’s no surprise that as soon as my toddler wakes up in the morning, she wants to know what’s for breakfast. And not 20 minutes after breakfast, she wants to know what’s for lunch. Breakfast and lunch are her favorite meals — she usually gets to choose her main course (within reason), then is subjected to my side-dish-of-discrestion (vegetables). 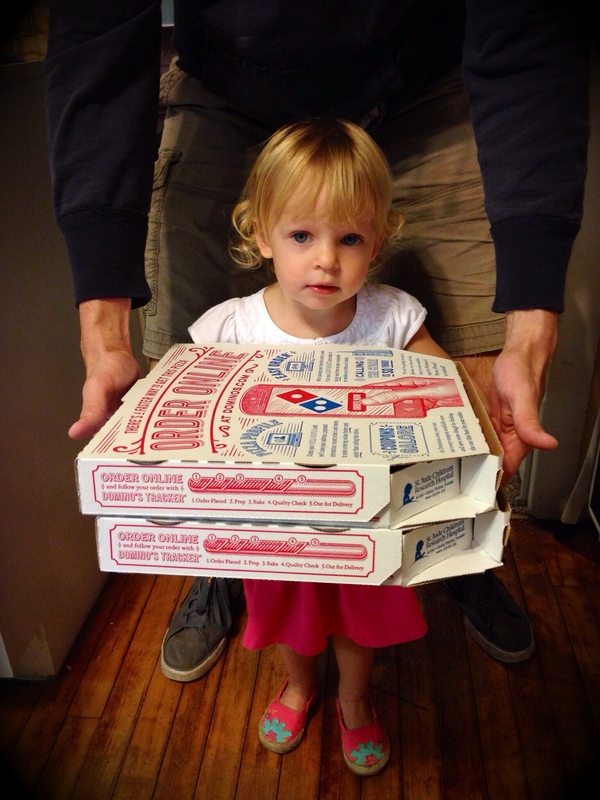 Now, here’s where our day falls apart: dinner. Inevitably, somewhere between lunch and our afternoon activities, she will ask, “What’s for dinner, Mommy?” Ugh! I dread this questions. I have nightmares about this question. I usually sugarcoat the answer to avoid a meltdown, and I always lead with the starch: “Rice with super yummy sausage and beans!” or “Risotto with pretty pink shrimp!” This works about 50% of the time. But, for whatever reason, if my answer contains the word chicken, she falls to the floor in tears, wailing, “Nooo, not chicken!” I don’t understand this. She loves chicken. She can eat her weight in chicken. It’s the single most popular food item that she will clear off her plate every time I serve it. EVERY. TIME. Below is a dish, that when spoken aloud, sends my child into another universe with despair, but always inducts her into the “clean plate” club. It’s simple. It’s delicious. But it could probably use a better name; maybe “Sweet Squash with Spinach Pinwheels and (spoken softly)…chicken.” Again, good luck! I know you’ll enjoy it, hopefully your kids will, too. This recipe comes to you by way of my former employer, Martha Stewart, and is an easy way to prepare deliciously tender chicken breasts. You can put your own personal touch on this versatile recipe by experimenting with other toppings such as oven-dried tomatoes, chopped Kalamata olives, and feta cheese; or fresh diced tomatoes & avocados with cilantro leaves and a squeeze of lime. Preheat oven to 425°. Distribute squash and onion evenly on 2 rimmed baking sheets. Drizzle with 1 Tbsp. oil, season with salt, and toss to coat. Spread in a single layer and roast until squash is tender, about 15-20 minutes. Meanwhile, pound chicken to a ⅛-to-¼-inch thickness. 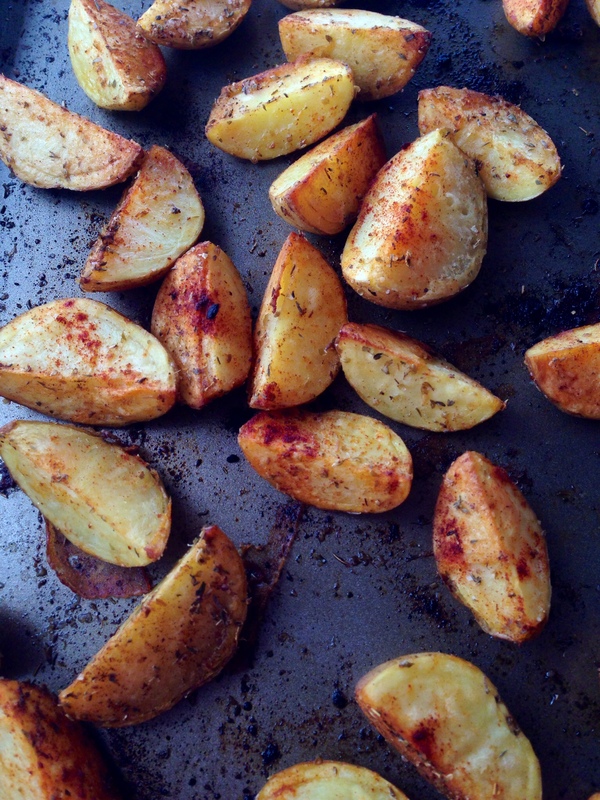 Season on both sides with salt and red-pepper flakes (see Tips*). Heat a large skillet to medium-high heat. Swirl in remaining Tbsp. oil, then butter. 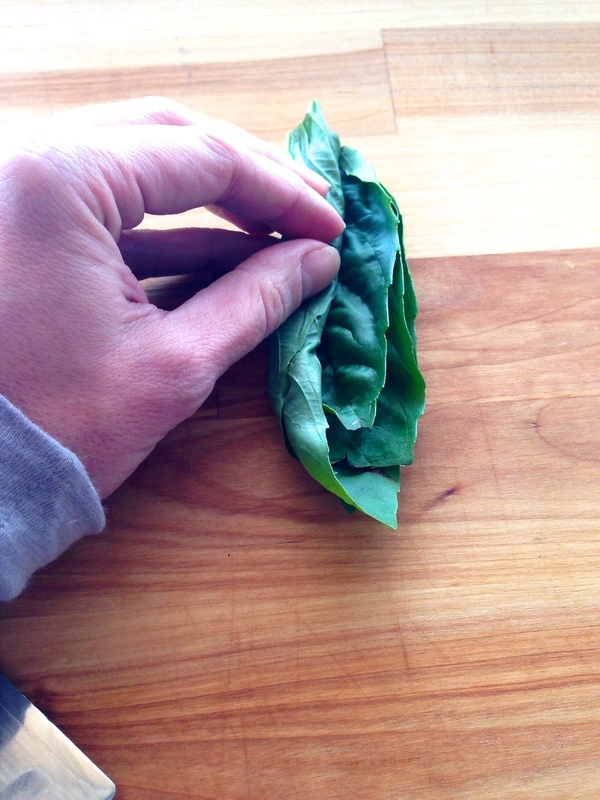 Fry sage until just crisp, about 30 seconds to 1 minute; let drain on a paper towel. Working in 2 batches, add chicken to pan and cook until golden and cooked through, about 2 minutes per each side. 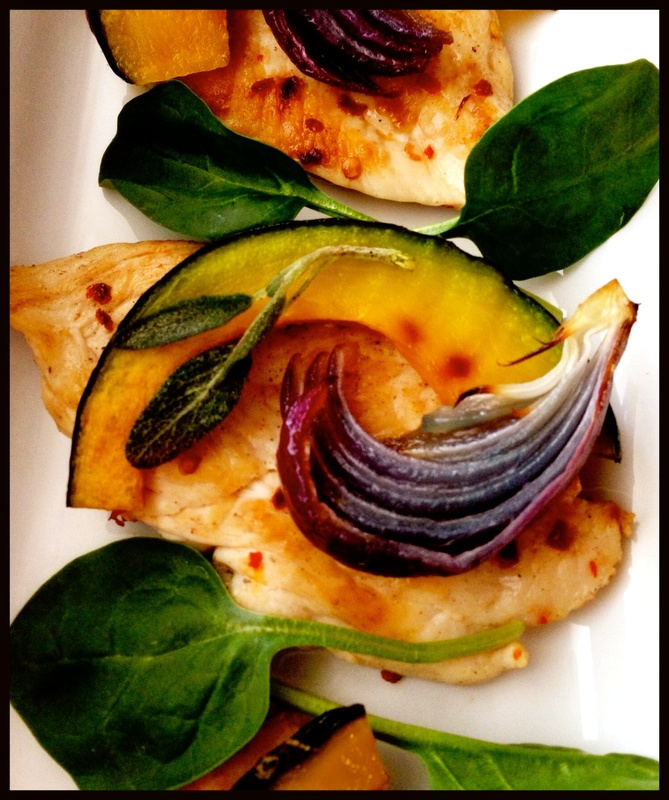 Divide chicken among 4 plates and top with spinach, squash, onion, and sage. 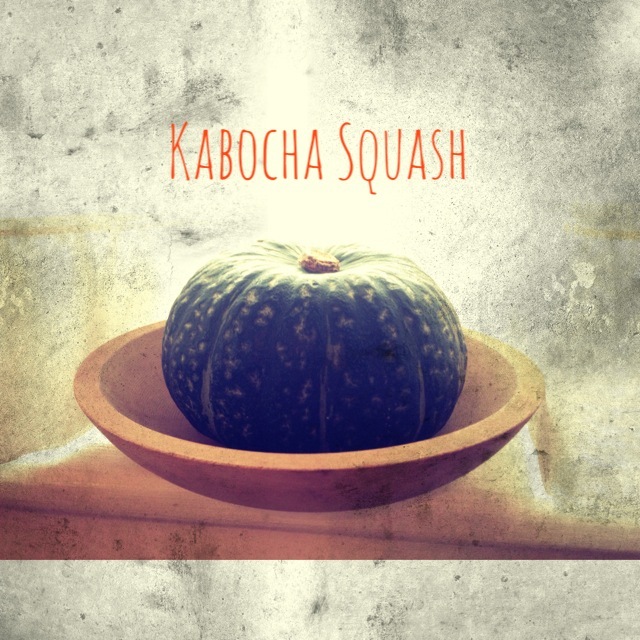 If kabocha squash (pictured below) is unavailable in your supermarket, substitute acorn squash — both can be eaten with the rind, just remember to remove the stem and end piece. 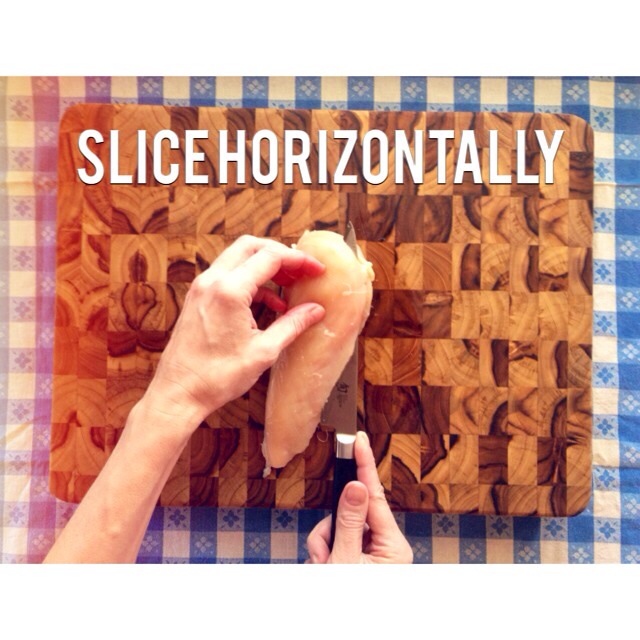 To halve a chicken breast, lay the breast flat on a cutting board with the smooth side down. 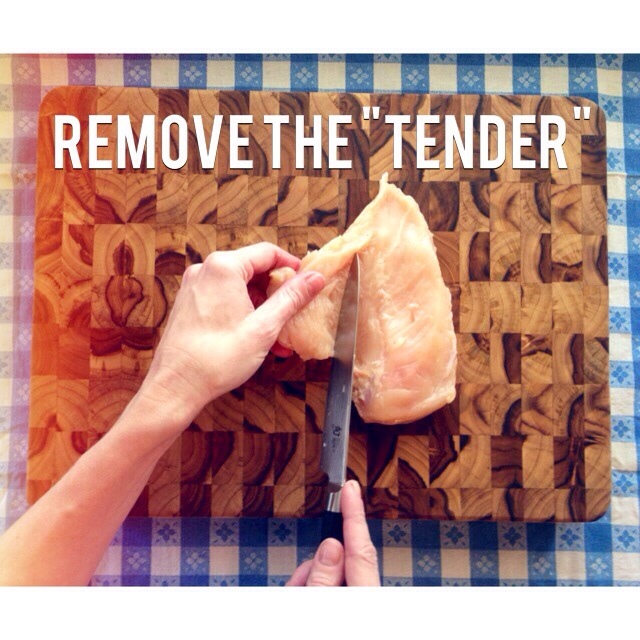 Using a sharp knife, cut away the small piece of meat that’s attached to the larger breast, called the “tender.” Set tender aside and freeze for another use (hint, hint…I’ll be posting a recipe for chicken tenders soon). Turn breast over. With your knife, begin slicing the breast in half horizontally, all the way through. Repeat with second breast. Lay 4 breast halves on a piece of plastic wrap and top with a second piece of plastic wrap. 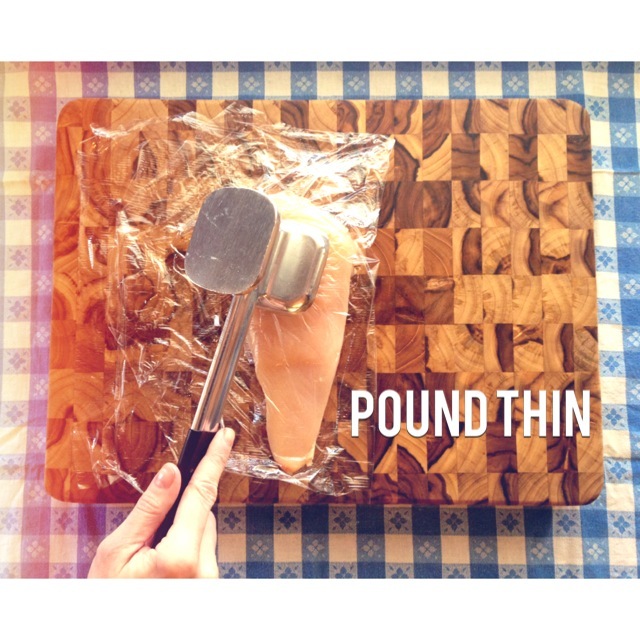 Using a meat mallet, pound chicken all over until you’ve reached an even thickness of about ⅛-inch. This dish pairs well with a Dry Riesling, which counters the slight heat from the red-pepper flakes. Serve chicken with red couscous (pictured): Cook 1 cup dry red couscous per package instructions, but replace water with chicken stock. Once cooked, mix in ¼ cup slivered almonds. I found this recipe in one of my husband’s Men’s Health magazines over the summer (I’ll let you draw your own conclusions on the similarity of a grown man’s pallet to that of a toddler’s.) I was able to throw this meal together in 15 minutes, then crossed my fingers that it was something my daughter would eat — she did, and now it’s one of her favorites. Hallelujuah! Juice and zest lemon. 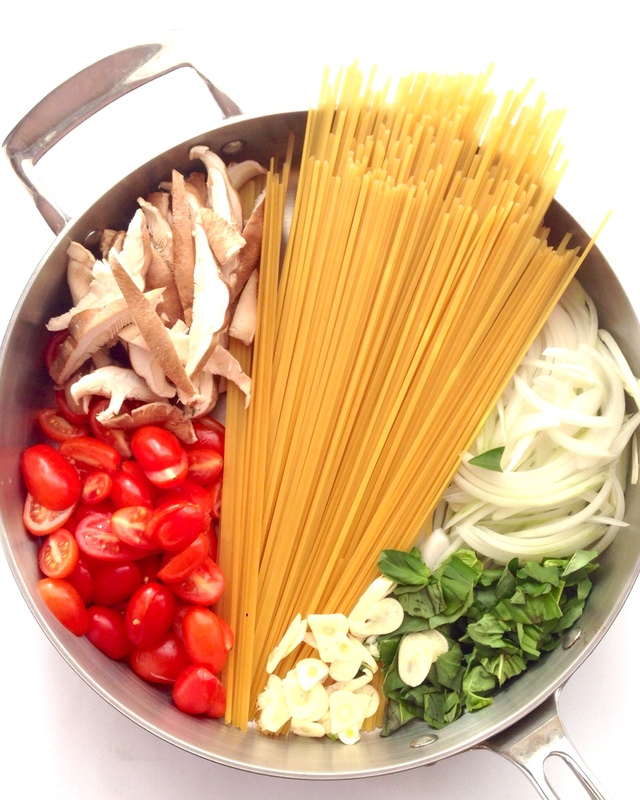 Cook pasta per package instructions; drain, saving ½ cup of cooking water. While the pasta cooks, drain tuna, saving 3 Tbsp. of the oil. In a blender or food processor, combine tuna, reserved oil, lemon juice, anchovies, and ⅛ tsp. red-pepper flakes; process until smooth. 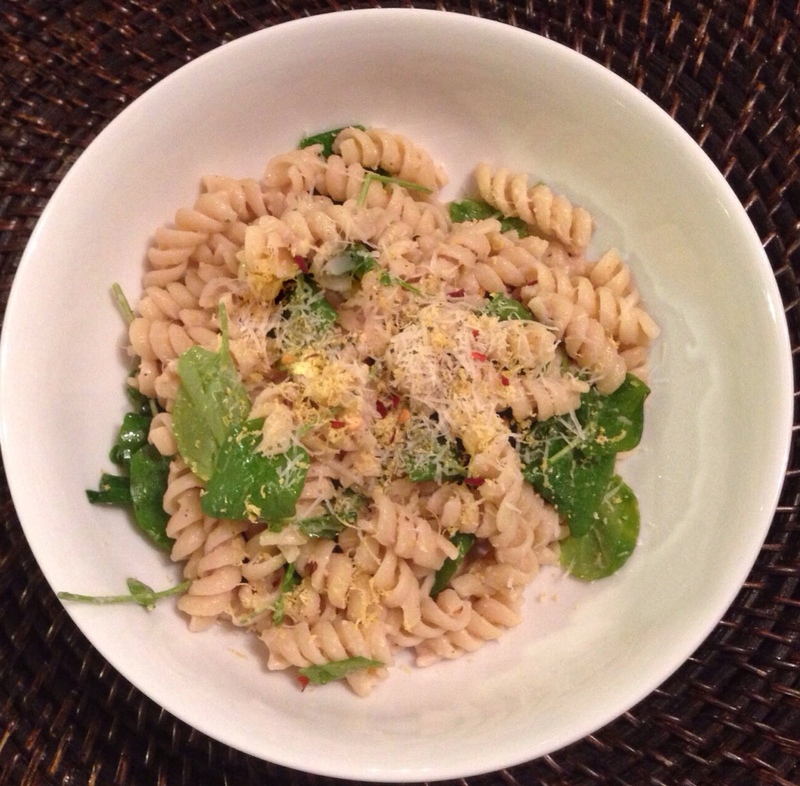 In a large bowl, toss the hot drained pasta with tuna sauce (thin with pasta water if necessary). Add arugula, lemon zest, salt & pepper, and remaining red-pepper flakes (see Tips*). Serve topped with fresh grated parmesan cheese and cracked pepper. I waited to add the final ⅛ tsp. red-pepper flakes until after I dished my toddler’s serving to save her delicate tastebuds from too much heat (if there is such a thing). To make this a heartier meal, buy an additional can of tuna, drain, then add chunked tuna to the finished pasta. 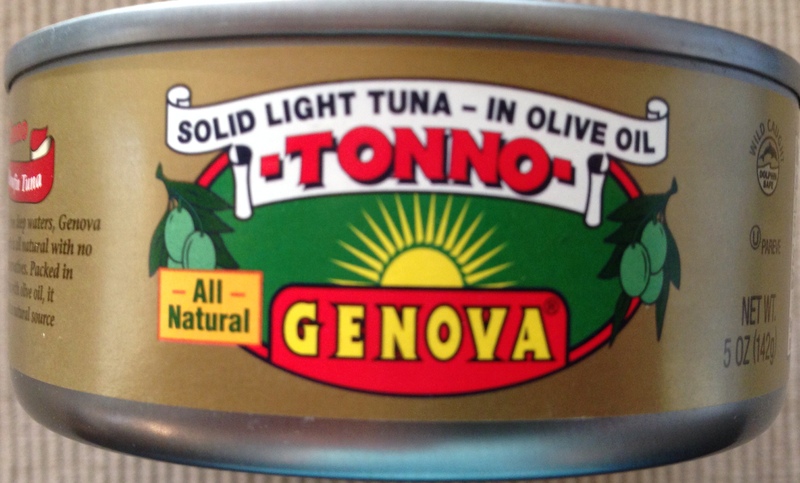 Look for Genova brand tuna, if available (pictured below).